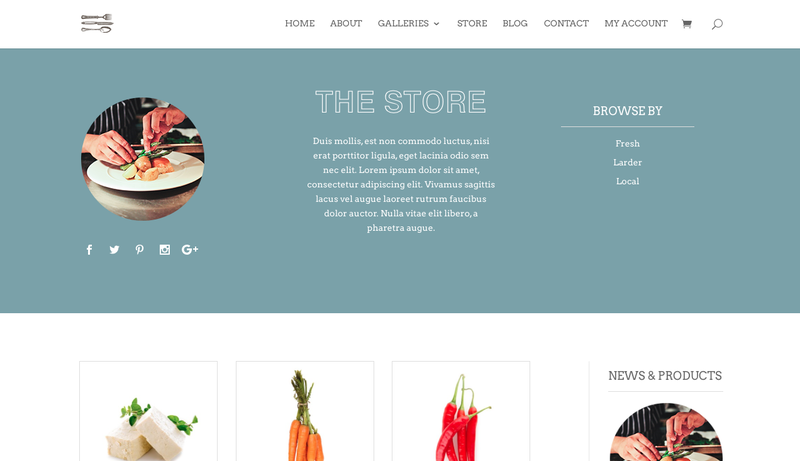 Divi child themes really are wonderful things. 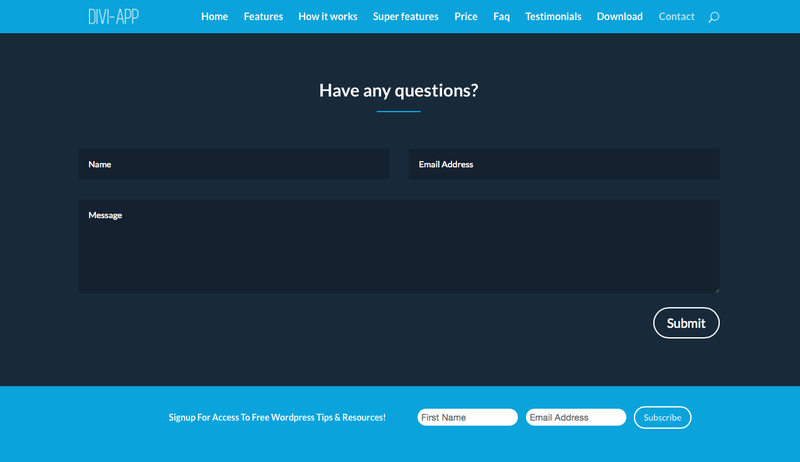 They allow you to create websites in rapid time, as opposed to building from ground up, and all of the bells and whistles are already set up for you. 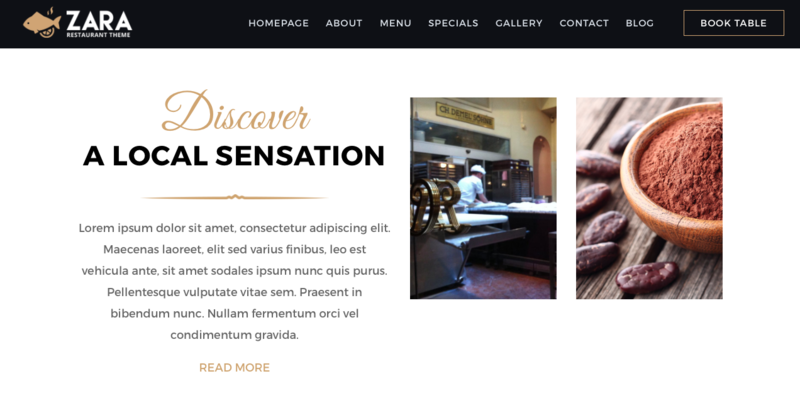 Every aspect of a web build – including UX planning, aesthetic design, layout, animations, and functionality – is already crafted, and all you need to do is simply enter your relevant content and imagery. 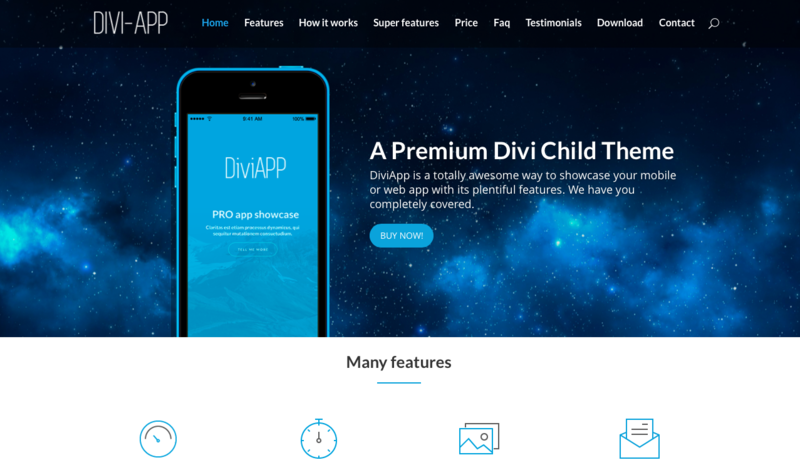 There are some absolutely amazing Divi child themes created by incredible child theme designers and developers, and to help you with making a purchase decision, we’ve rounded up a collection of the Top 30 Divi Child Themes available. 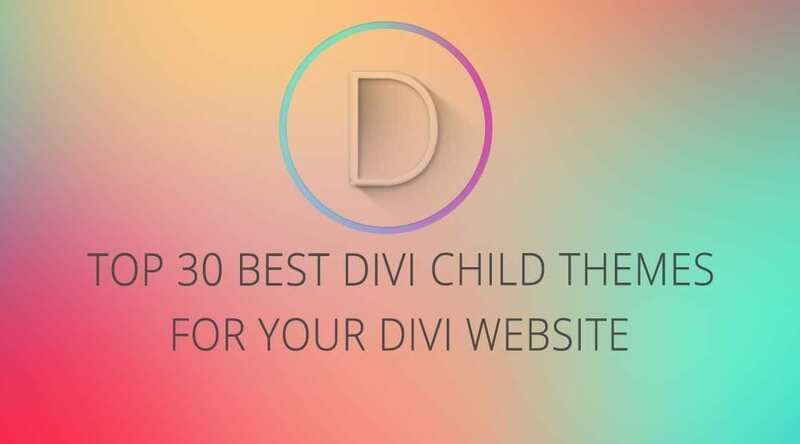 For the purpose of this blog post, we’ve tried to split our list of the Top 30 Divi Child Themes into categories that would align with your potential clients’ business industries. Often, child themes are built to be extremely versatile, so there are bound to be crossovers within these industry categories. Keep an open mind when reading this blog post. 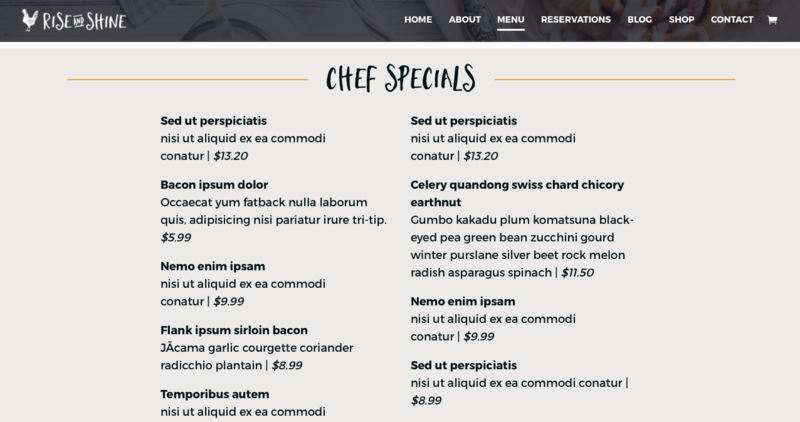 One of the best things about being a web designer or developer is the ability to imagine a client’s brand and content types within new forms, so if you’ve found a great restaurant theme that would be perfect for a tattoo artist or an ad agency, don’t hold back on purchasing it and making it your own. 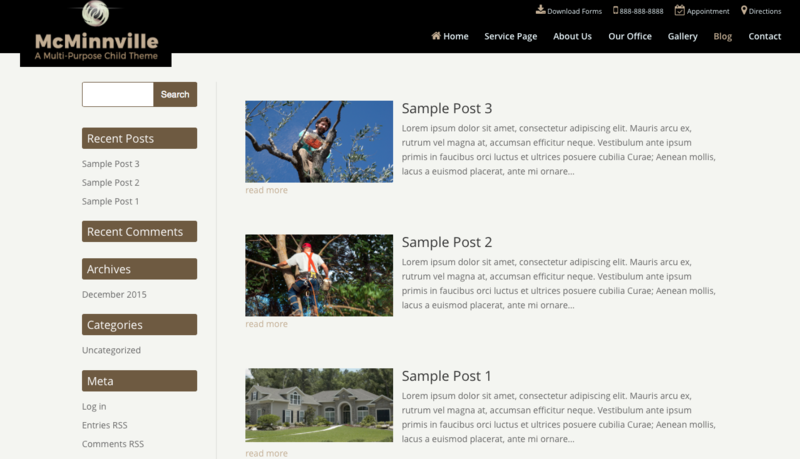 Each of the child themes are highly customizable so entering your own or your client’s content will be a breeze. 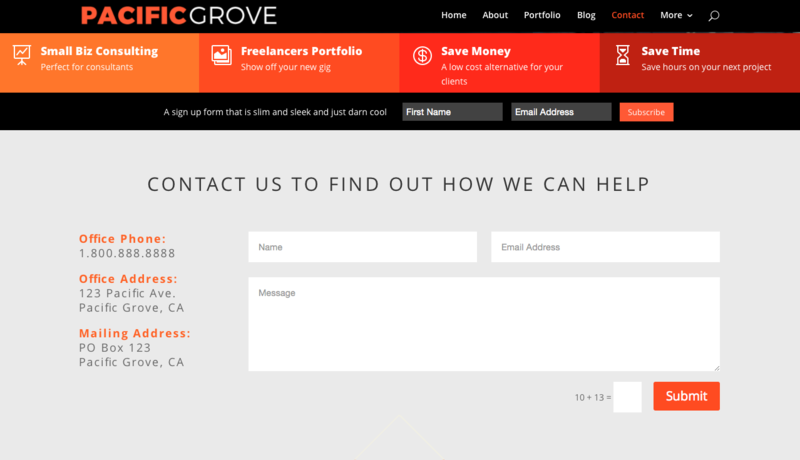 And if you ever get stuck, just contact the child theme developers via their respective sites. 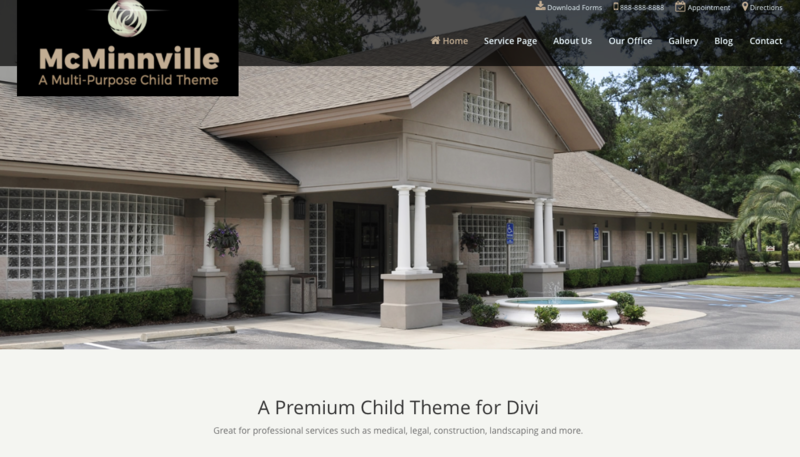 To run any of these awesome Divi child themes, you must have the latest version of Divi by Elegant Themes installed. 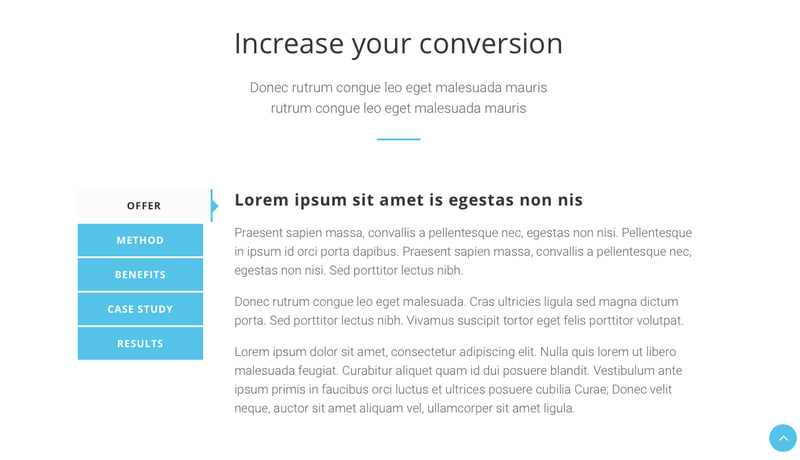 Once Divi is activated, simply upload the .zip file of your child theme (in the exact same way as you uploaded the Divi .zip file). Again, install and activate the child theme. 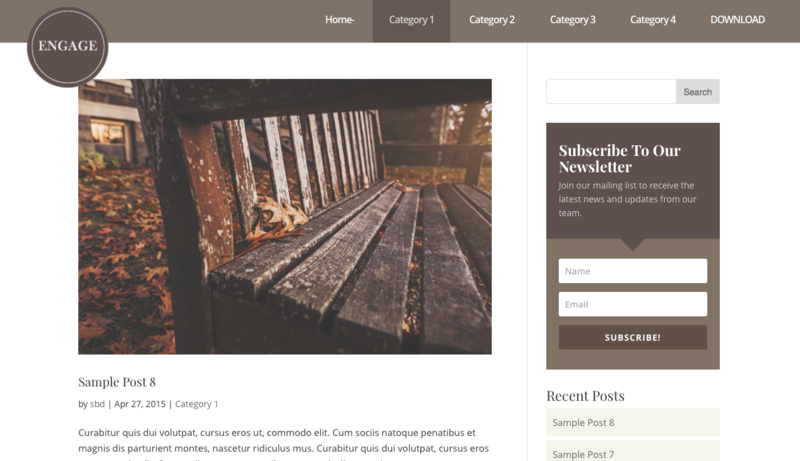 This ensures that Divi will run as the parent theme and that the child theme will inherit all of the relevant functionality. 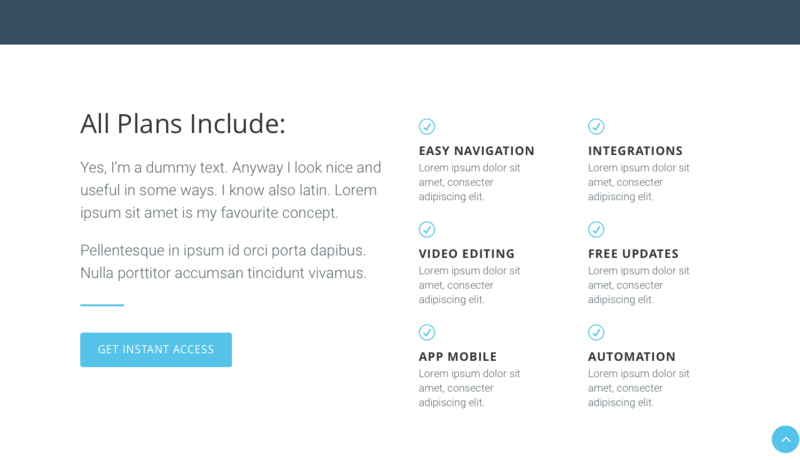 Once up and running, you’re free to enter all of the relevant content for your or your client’s site. Please Note: The child themes listed below (bar our own) have not been independently tested by Aspen Grove Studios. This post serves merely as an opinion piece. 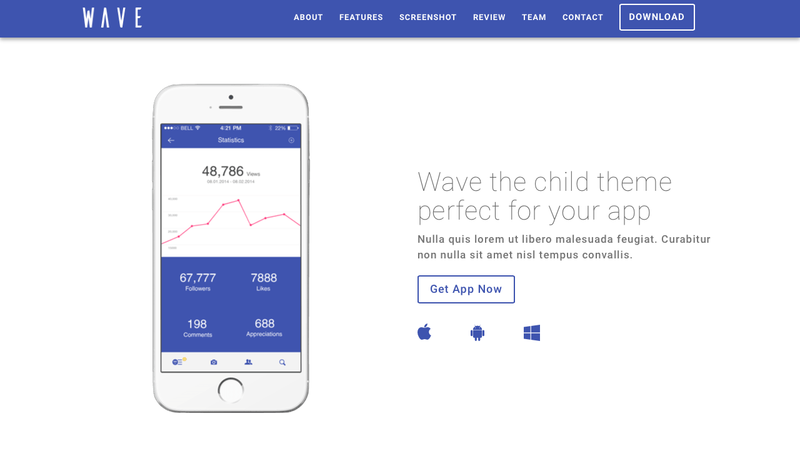 The child themes have been selected objectively – and are listed in no particular order – to showcase the work of the Divi child theme developers. Should you purchase one of the child themes listed below, Aspen Grove Studios cannot be held liable for any mishaps that may occur as this is the responsibility of the respective developer alone. 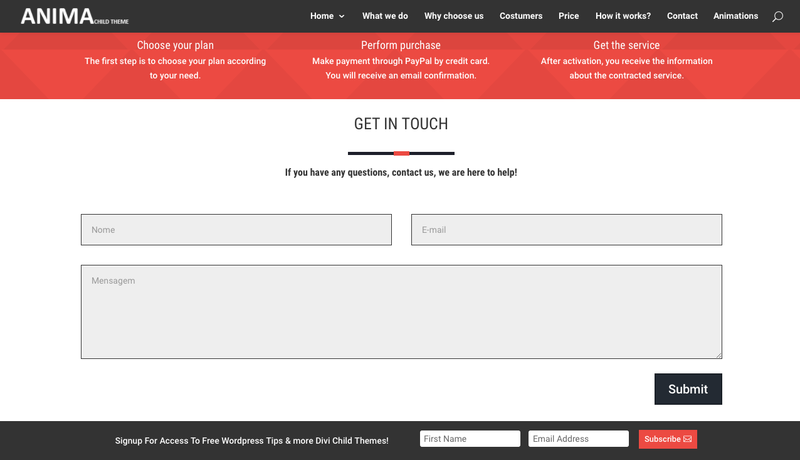 If any problems with your child theme do arise, please contact the developer directly. If you experience any problems with one of the Aspen Grove Studios child themes, please feel free to contact us by opening a support ticket – we’re happy to help! 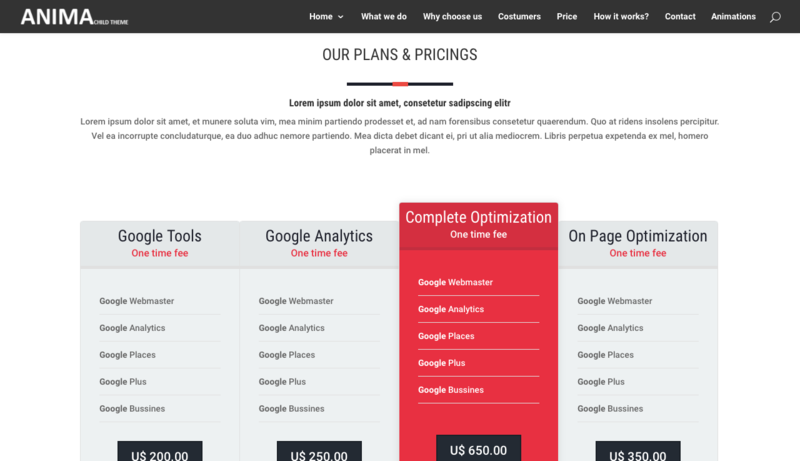 All prices (in USD) and images are at the time of writing. At the time of reading, some discounts, sale prices and special offers may no longer apply. With this, the original product values are provided in the event that any price fluctuations may occur. 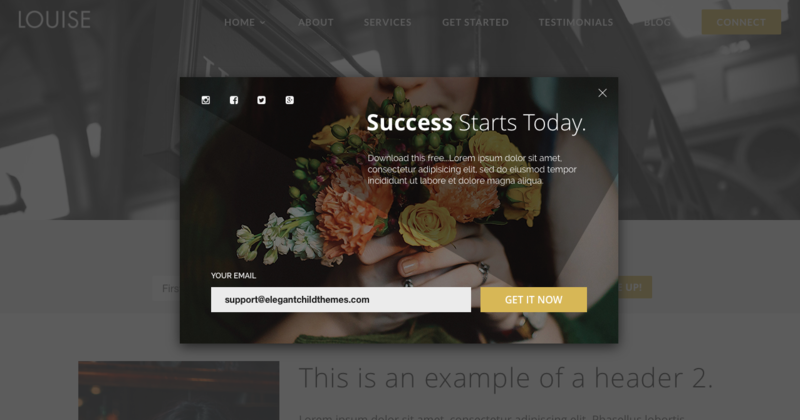 If you’re busy with or are about to begin, a client web build for either a small business, a corporate company, an agency or similar, have a look at the following Divi child themes. 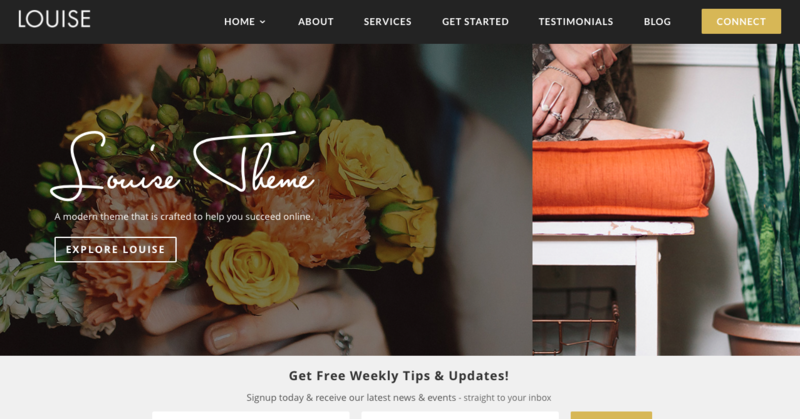 Each of the child themes listed below have design aspects and functionality that will really help let your client’s web build stand out from the pack. 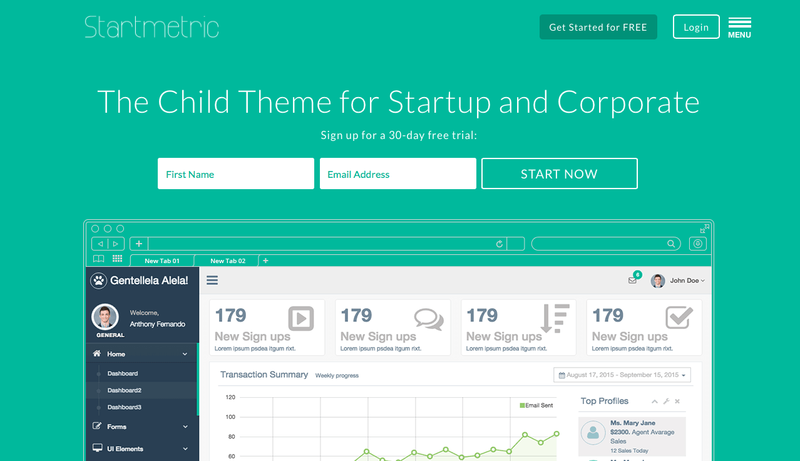 Created by Fabio Sarcona of Creative Child Themes, Startmetric is the perfect child theme to kick off your web dev project for a range of clients, including small businesses, start-ups or corporates. 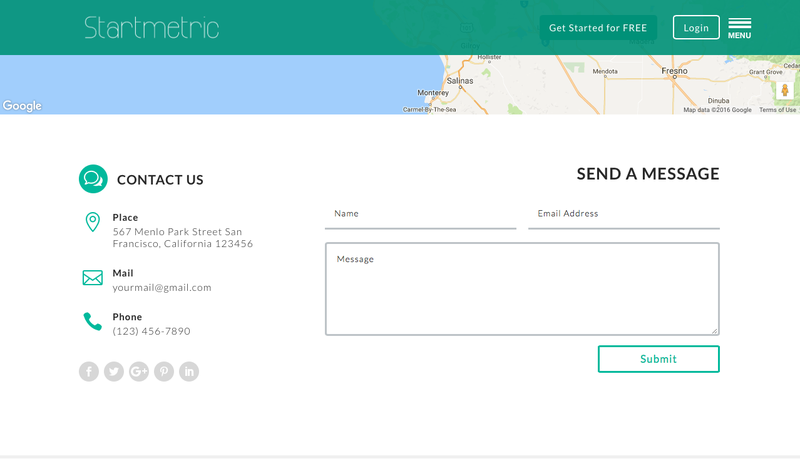 Strategized with conversions in mind, Startmetric uses a simple layout, slick design and prominent call to action areas and opt-in modules to assist in reaching your or your client’s business objectives. 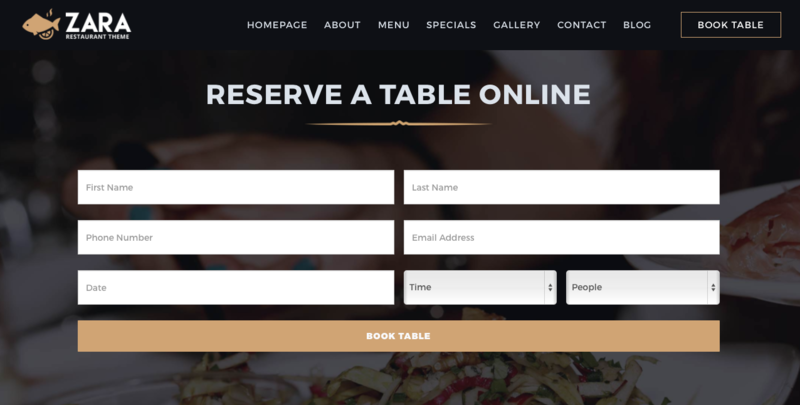 With two separate menus, one emulating an app-style menu, you can really play around with form and function here, and with several pre-made pages – and two versions of the contact page – all you really need to do is add your content and you’re all set. 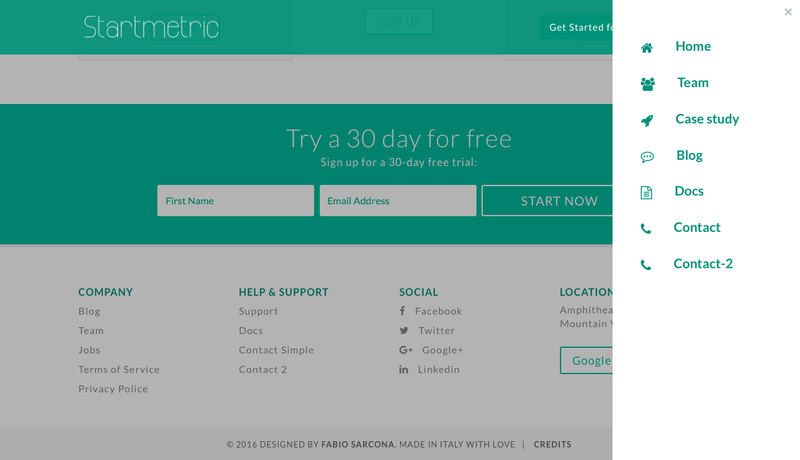 View the Startmetric demo or purchase it from Creative Child Themes for $ 97.00. 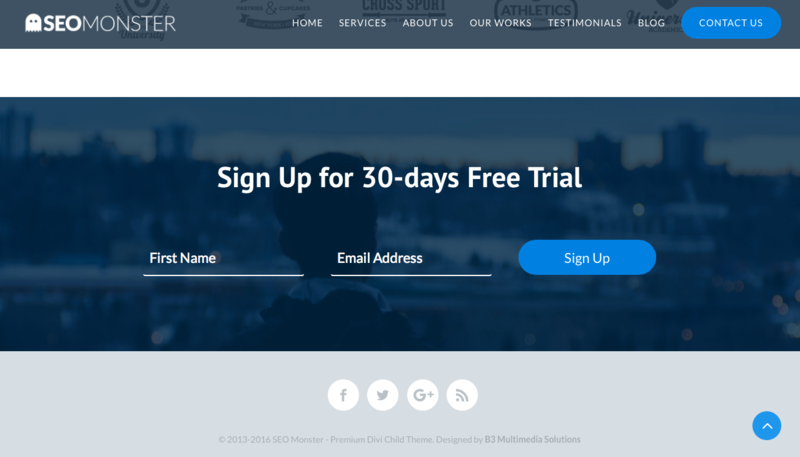 SEOMonster by B3Multimedia is a really versatile child theme, and despite the name, can be customized to fit a range of businesses, agencies, and corporate clients. 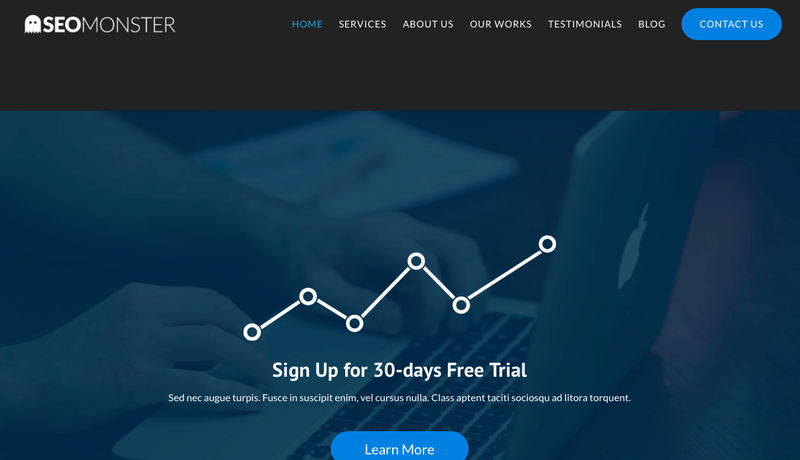 Making use of some of Divi’s most applicable business-driven modules SEOMonster includes ready-to-go pricing tables, opt-in forms and number counters, which can easily be customized to show varying forms of business health and success. 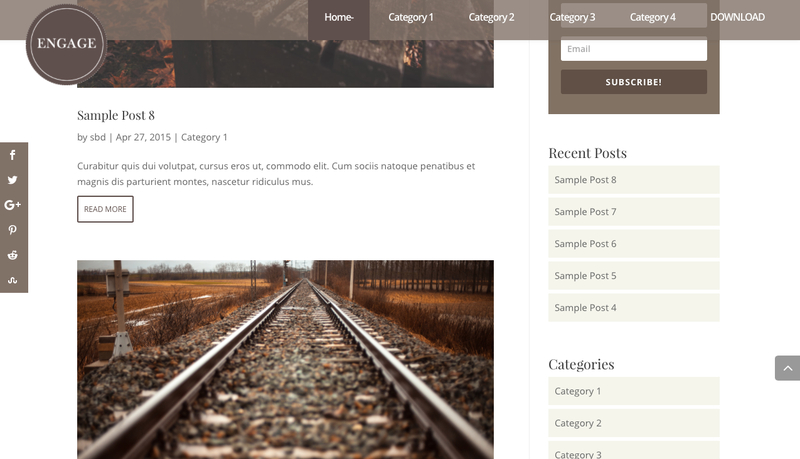 Subtle accents really set this child theme apart, including small animations along the navigation menu and blog sidebar. 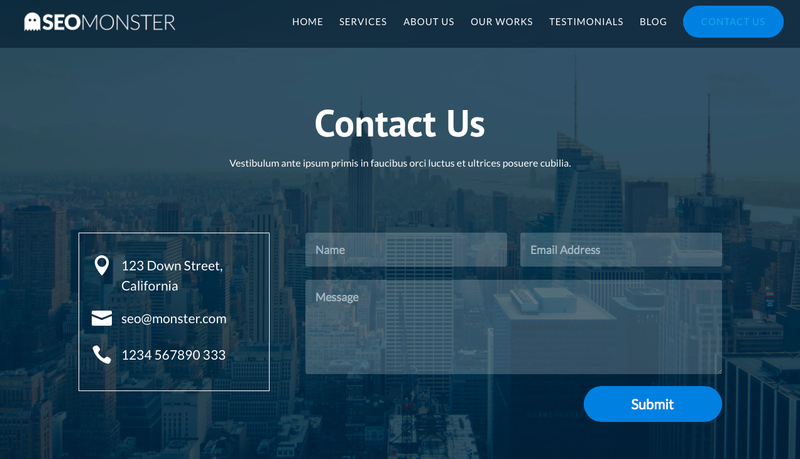 To top it off, SEOMonster includes a custom footer (with easy instructions to navigate the footer.php file) to help you really make the site your own. View the SEOMonster Demo or purchase it from B3Multimedia for a special sale price of $ 44.00 (valued at $ 55.00). 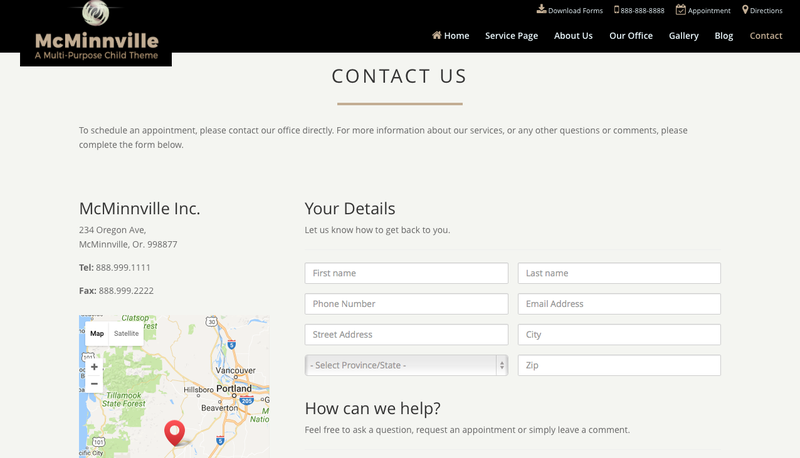 For clients that require a slightly more complicated website, look not further than McMinnville by Monterey Premier. 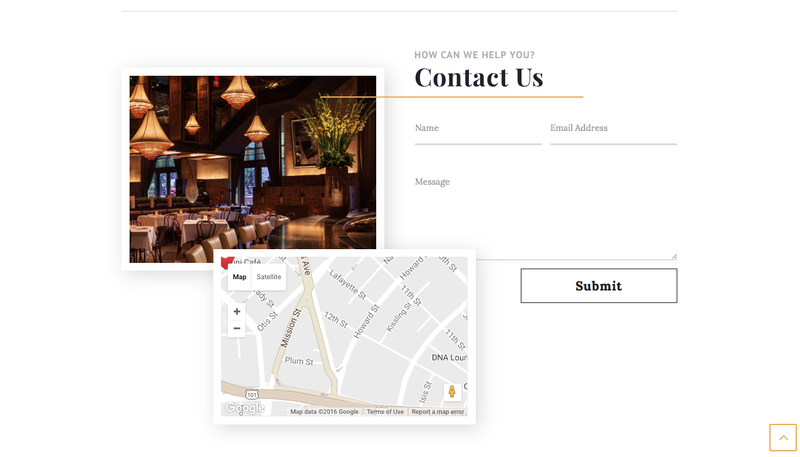 Adaptable to fit just about any market industry, McMinnville makes use of a mega menu (perfect if your clients have a multitude of service offerings or business aspects), as well as a great primary and secondary menu for easy navigation and quick access to contact information. 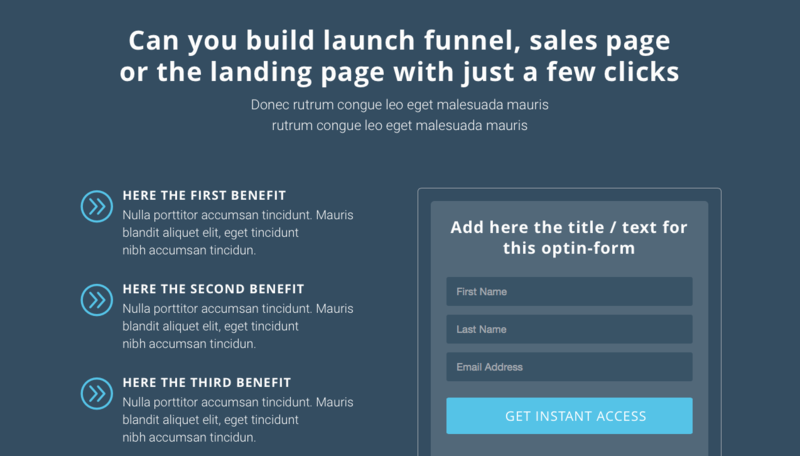 The super-slim opt-in form adds a great extra touch to the theme, offering a subtle suggestion for sign ups as opposed to large pop-ups. 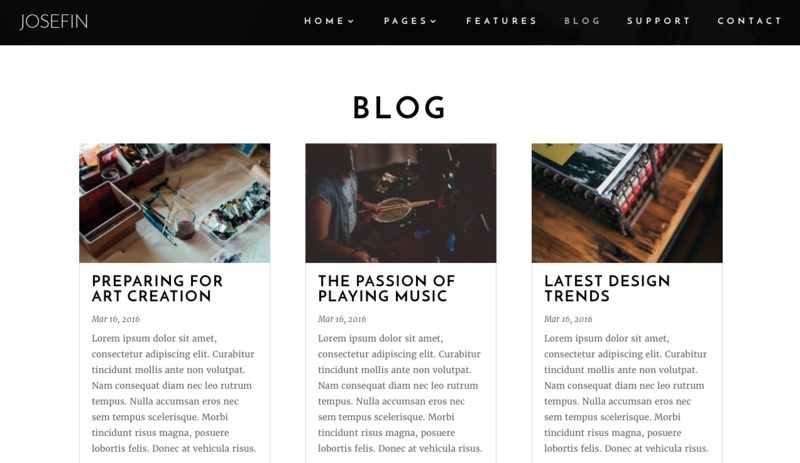 Also, the blog has been spruced up with some stylish CSS to give the standard blog layout a bit of a unique look and feel. View the McMinnville Demo or purchase it from Monterey Premier for a special sale price of $ 55.00 (valued at $ 175.00). 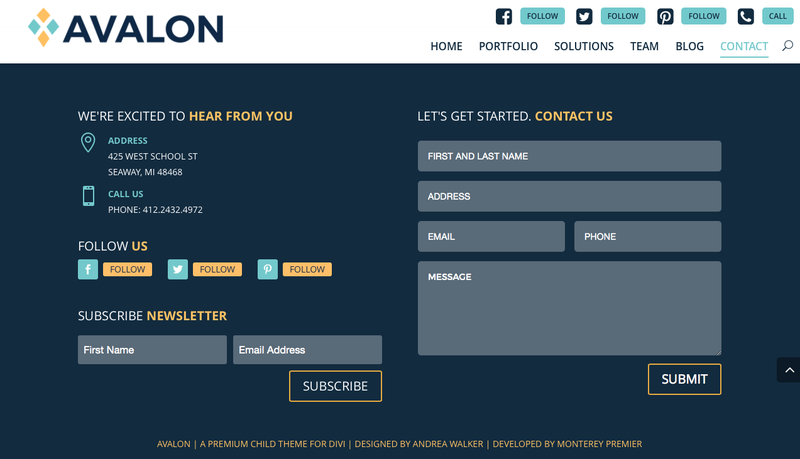 Designed by Andrea Walker and developed by the team at Monterey Premier, Avalon is another great child theme option for clients fitting into the business or agency category. 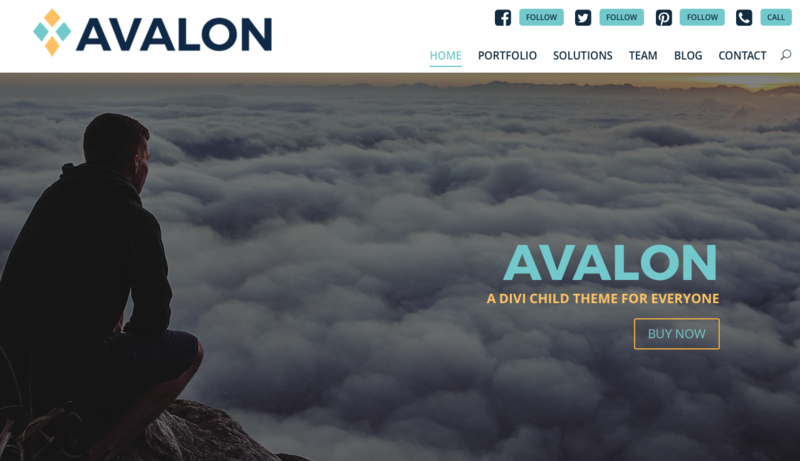 With loads of white space, contrasting colors and nicely designed areas that accommodate text in varying forms, Avalon really lets you emphasize your content, and the use of angled sections adds another unique visual aspect to the overall modern look and feel of the child theme. 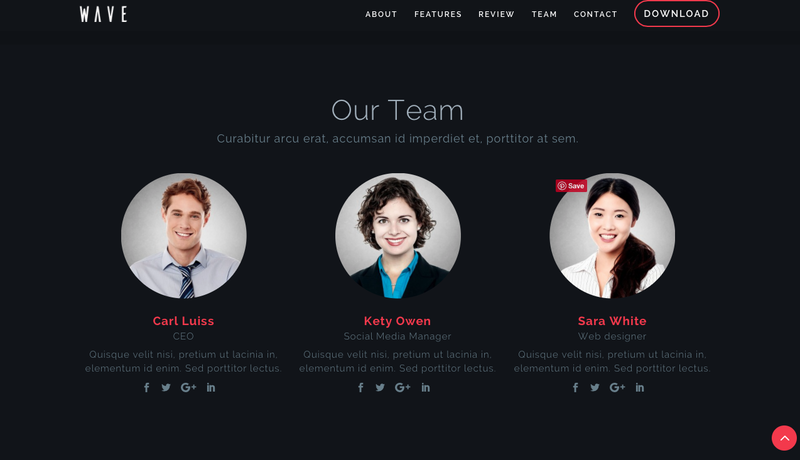 The Team page allows for pretty in-depth content entering, which is great for showing off a bit of extra information about the staff force or your client’s brand history and heritage if required. View the Avalon demo or purchase it from Monterey Premier for $ 175.00. Another great child theme from Monterey Premier, Pacific Grove is versatile enough to fit just about any brand or client. With a really great design – that uses customized modules, great color combinations, and contrasting sections – Pacific Grove just pops aesthetically and is sure to give even the most corporate client a breath of modern design flair. 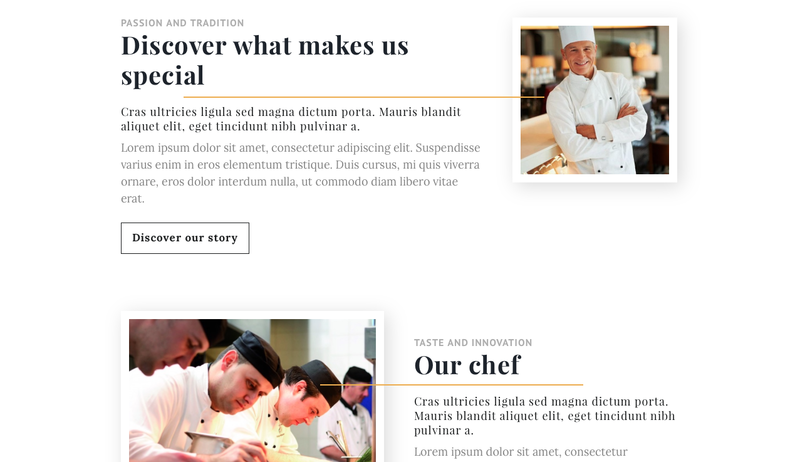 For portfolio project pieces (which can easily be adapted to case studies for business sites), the use of the Problem, Solution, and Conclusion sections are great ways to really tell the story behind a piece of work. A Monterey Premier favorite, Pacific Grove includes slim opt-in bars – which look particularly dashing as a social follow bar. View the Pacific Grove demo or purchase it from Monterey Premier for $ 175.00. 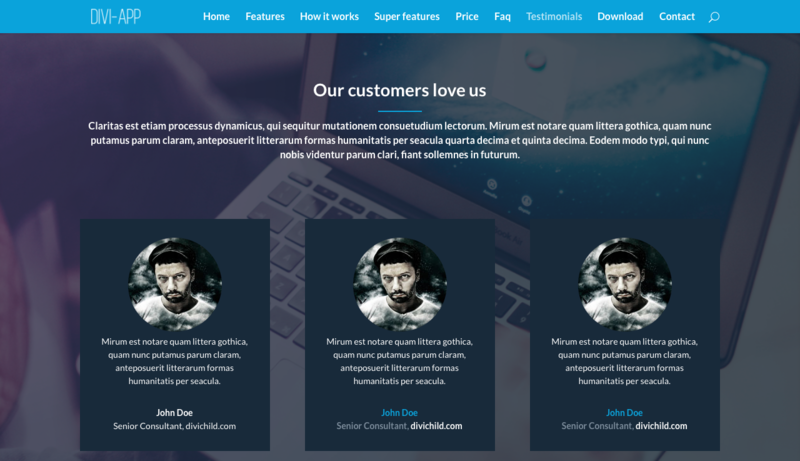 These Divi child themes will put your client at the center focus of their website, and so would work well for clients who are the core, crux and face of a brand. Here, these child themes would suit entrepreneurs, instructors, life or business coaches, authors and possibly even artists within a range of business categories and industries. 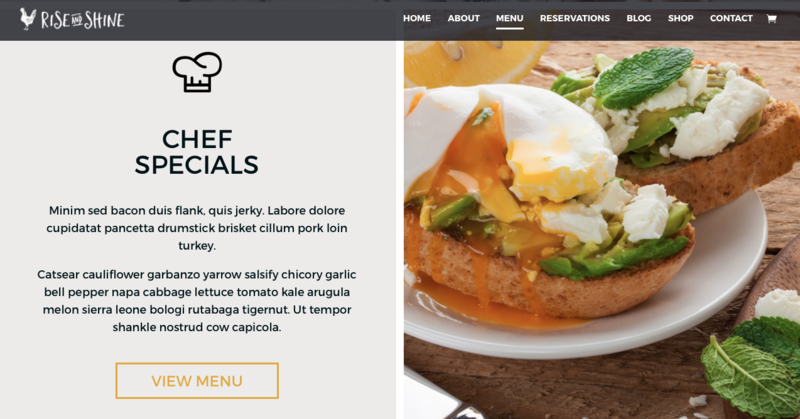 Good quality imagery plays a very big part in web builds – even more so if your client is a one-man show and is front-facing at the core of a brand or business. 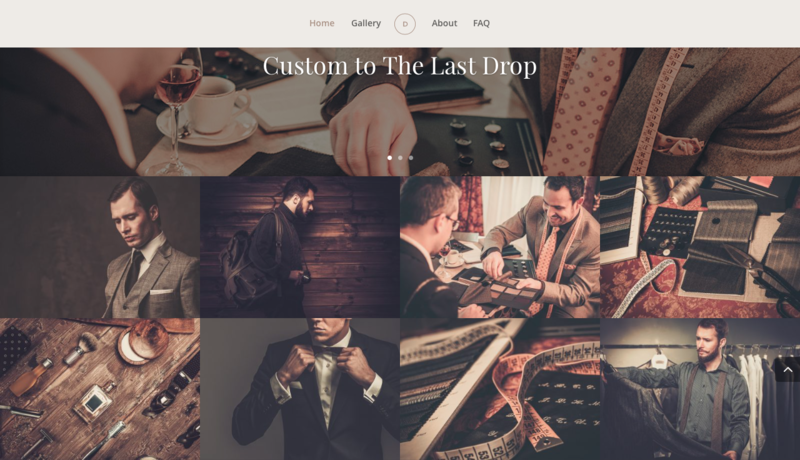 It’s clear by the demo imagery of these Divi child themes that photography could very well be a strong persuading factor toward the marketing success of person brand website. 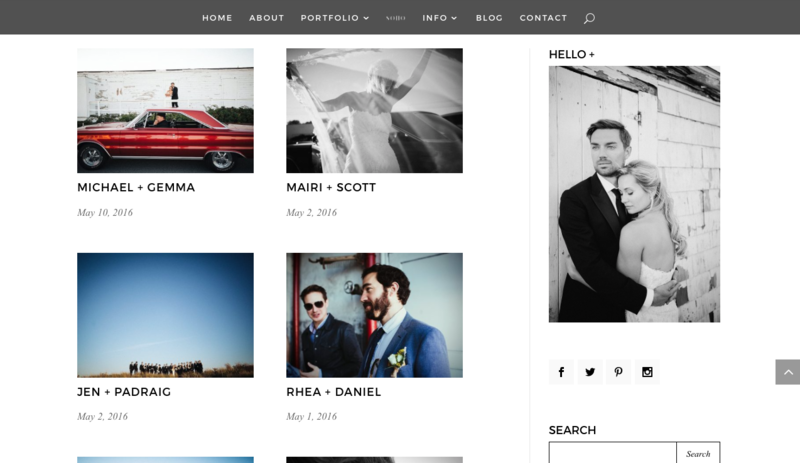 With this, urge your client to invest in taking good quality imagery of themselves to really paint a good picture of their personality. 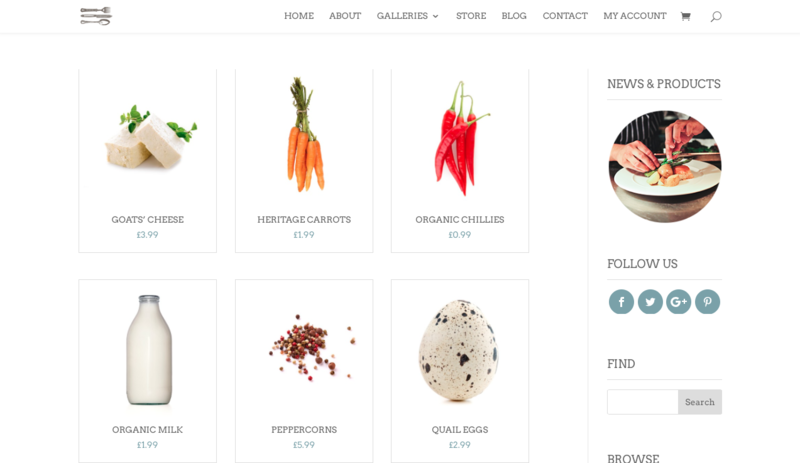 One of the leaders in the Divi child themes market is without a doubt, Michelle Nunan of Divi Soup. 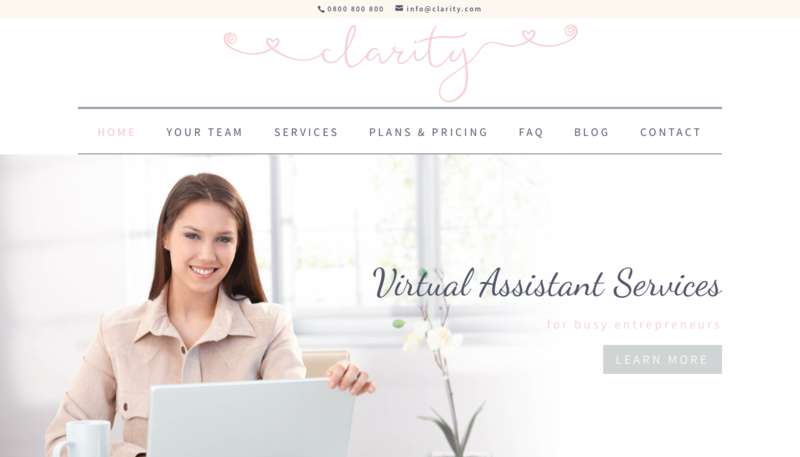 Versatile and Clarity are aimed at the online coaching and virtual assistant markets respectively, so these are both prepped and ready to go for any related clients you might have. Again, both of these child themes can easily be adapted to fit related markets. 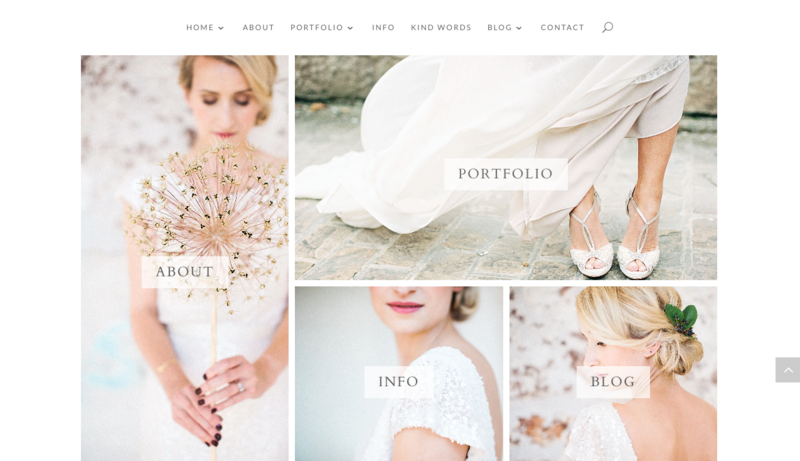 With soft pastel color palettes, handwritten/script header fonts and subtle heart graphic details in Versatile, both child themes promote a flawlessly feminine feel. 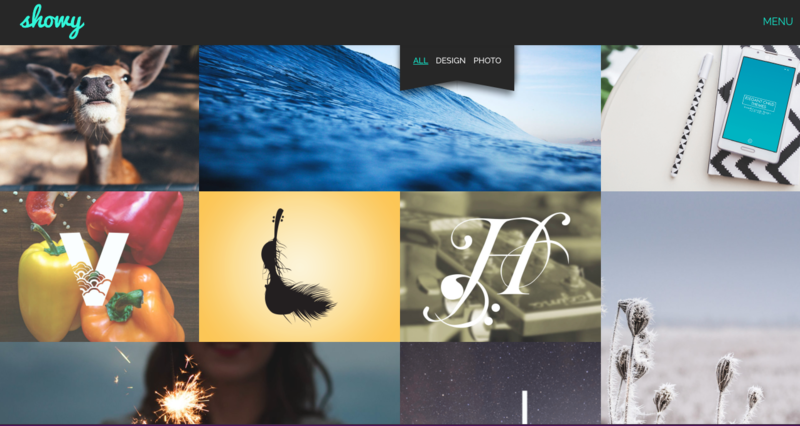 This, teamed with some great photographs of your client will give a really great sense of human essence to the web presence. 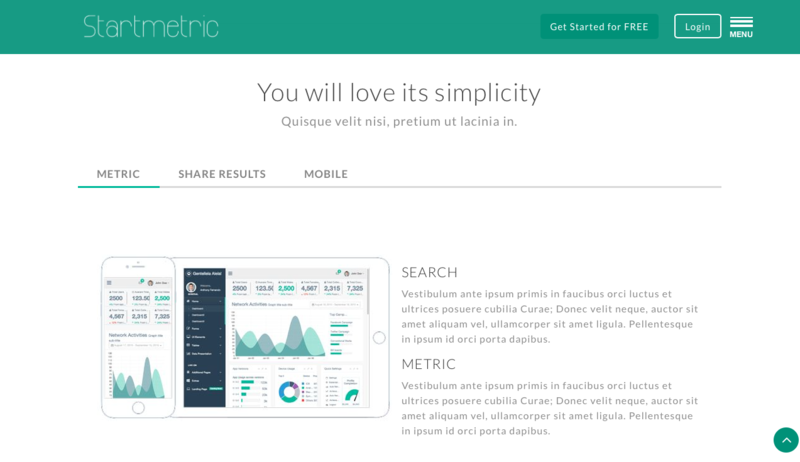 Versatile is particularly eye-catching as it makes use of really enticing and incredibly well-styled call-to-action sections. 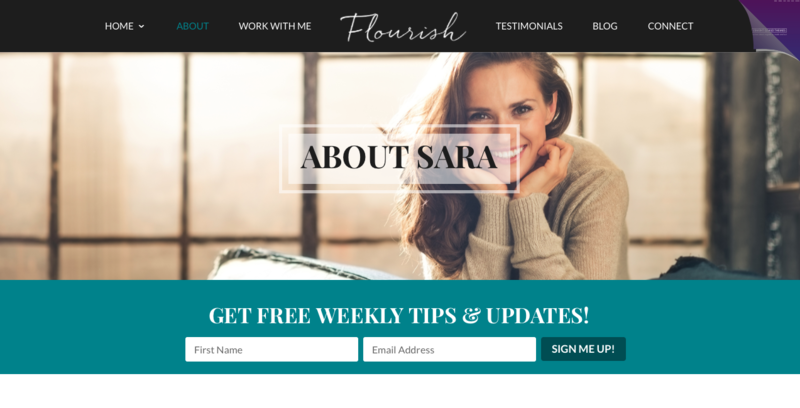 With this, your lady boss client is sure to get countless inquiries for business. 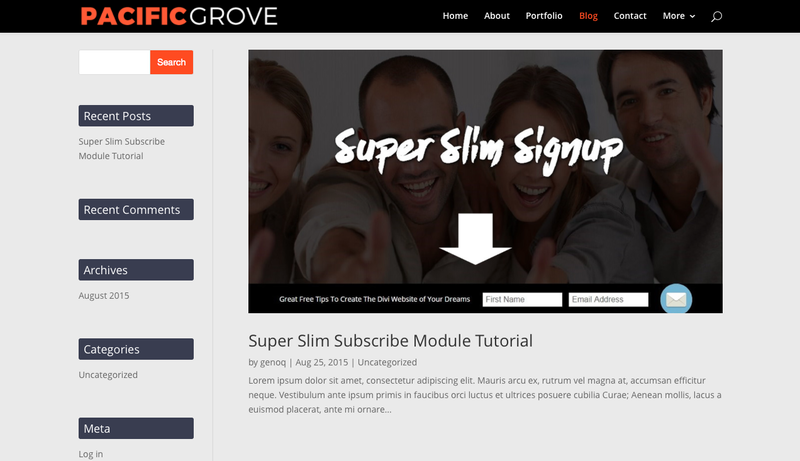 View the Versatile Demo or purchase it from Divi Soup for $ 67.00. 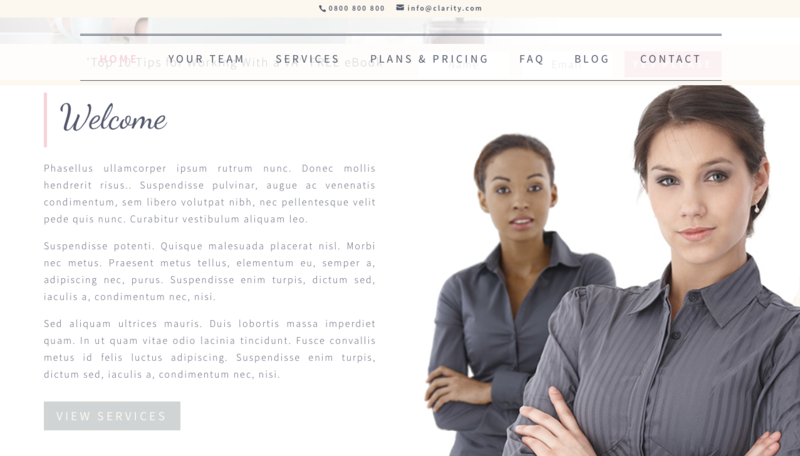 View the Clarity Demo or purchase it from Divi Soup for $ 67.00. 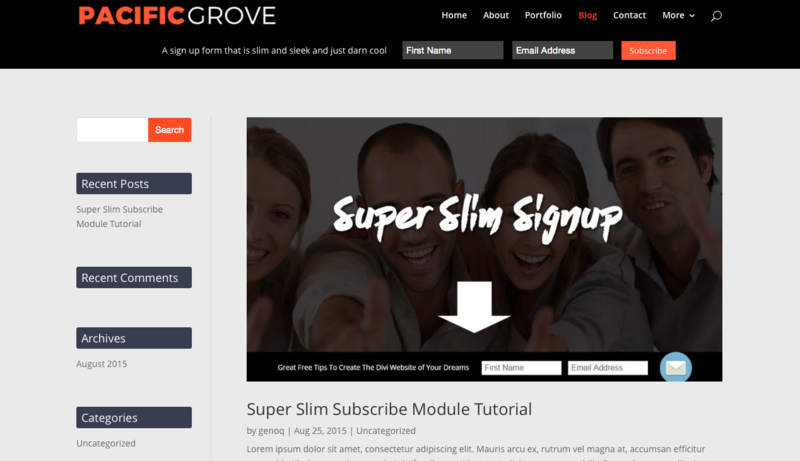 Superfly always delivers top class, well designed and expertly developed Divi child themes. 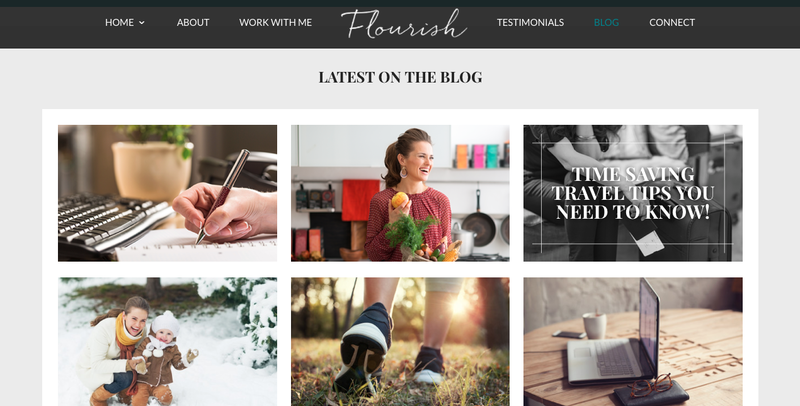 Designed by Carry Green and developed by Gruffy Goat, both Louise and Flourish are great child themes that can fit an array of business markets and industries, but would fit particularly well for small businesses, entrepreneurs and person brands. 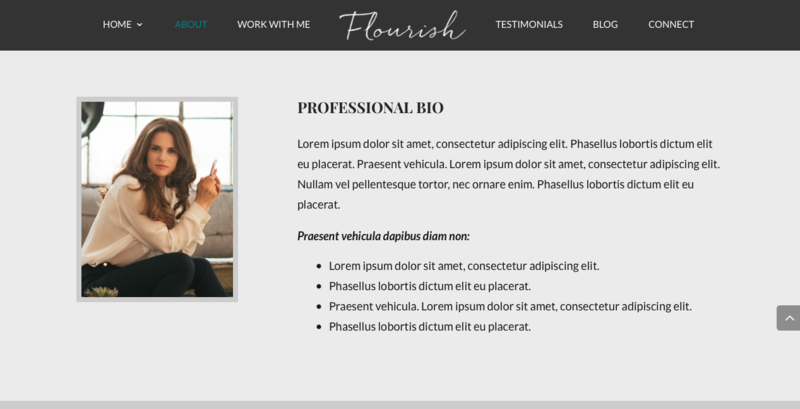 With a more gender neutral look and feel than Versatile and Clarity listed above, Louise and Flourish can easily be utilized for male-fronted business clients. 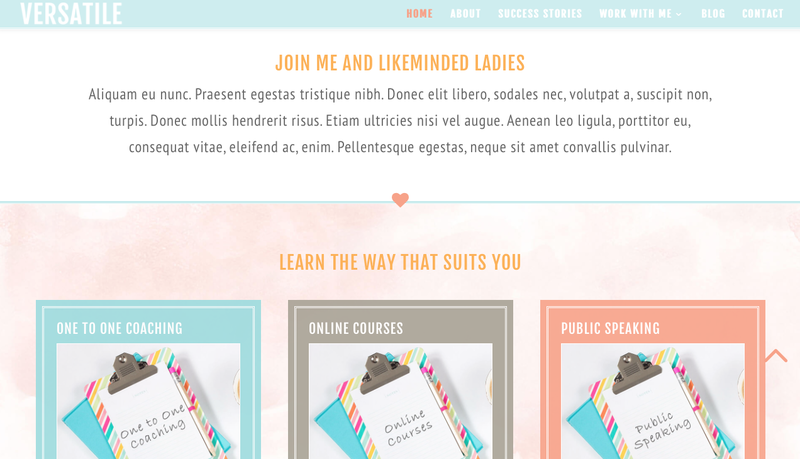 Louise includes two alternate Home Page and blog post layouts for you to choose from. 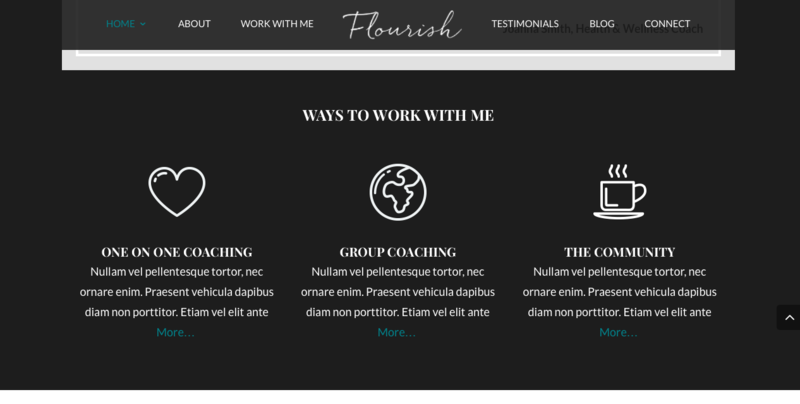 Flourish’s set up is a bit different. 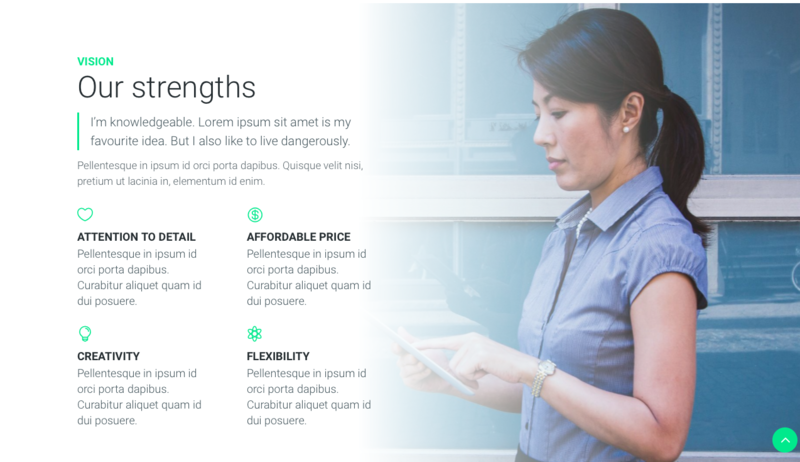 Within the demo site, you’re able to view the standard Home page as well as two additional pages: a sales page ($ 35.00) and a webinar highlight page ($ 15.00). 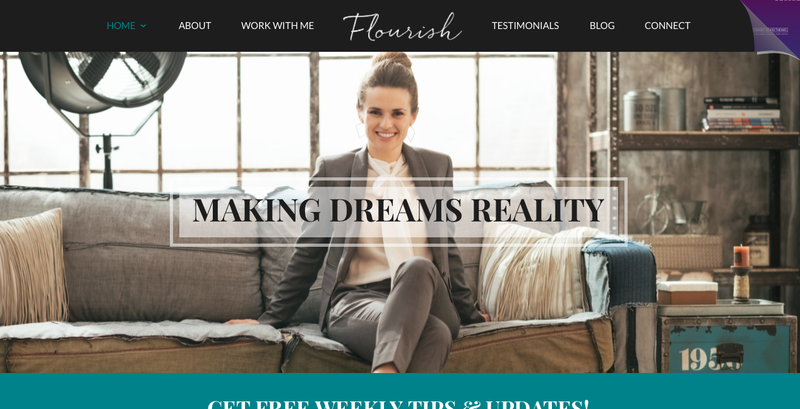 If you’re looking for a landing page, either of these could be purchased as separate entities, and/or accompany the Flourish theme, which is valued at $ 75.00. View the Louise Demo or purchase it from Superfly for $ 75.00. 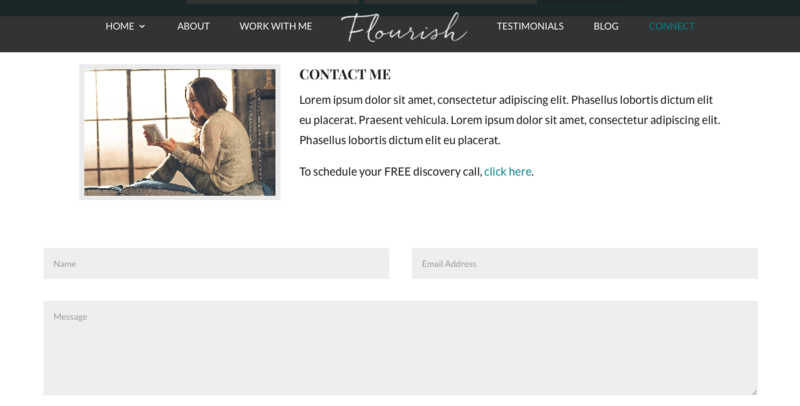 View the Flourish Demo or purchase it from Superfly for $ 75.00. Don’t forget to check out the sales and webinar pages for $ 35.00 and $ 15.00 respectively. 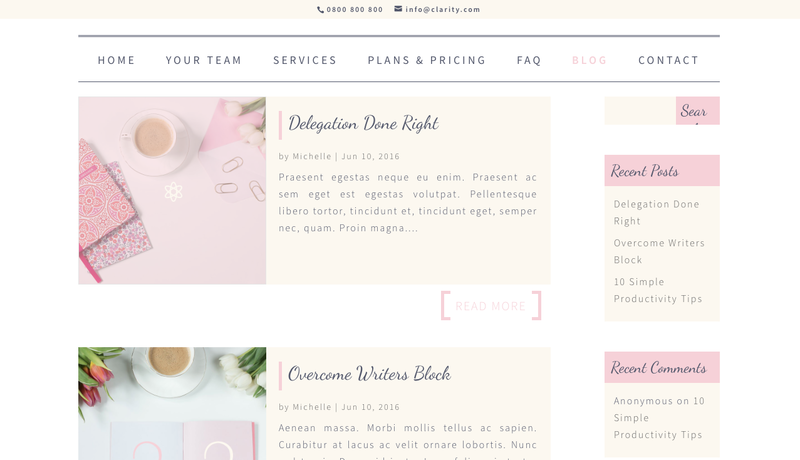 If you or your client are running and promoting a blog, the below Divi child themes would be perfect options for your web dev project. 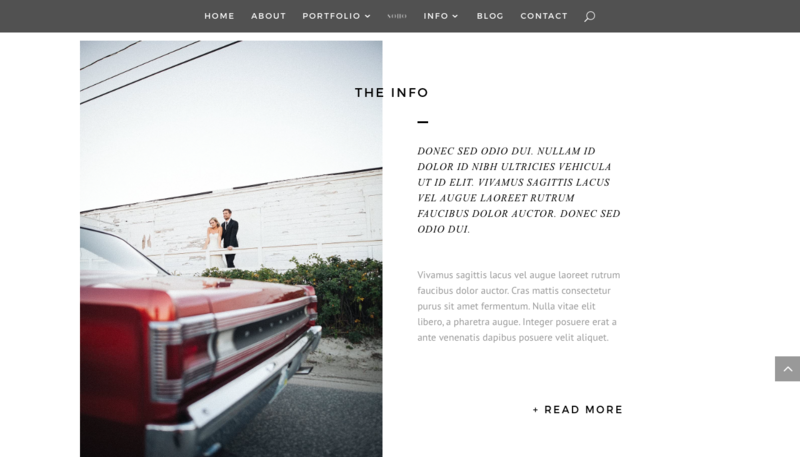 Blog sites should focus predominantly on the regular flow of content moving through the website. 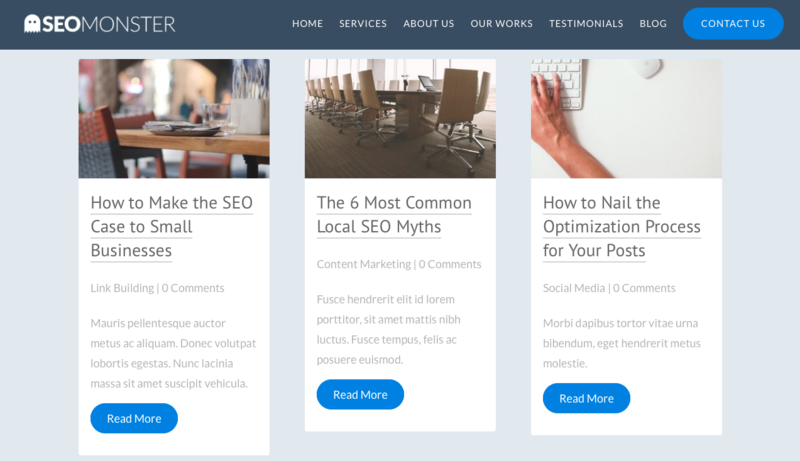 Here, a readers attention needs to be grabbed from the get-go, so your Home page should show-off a bunch of captivating headlines and enticing excerpts without too much distraction from the core of your blog post displays. 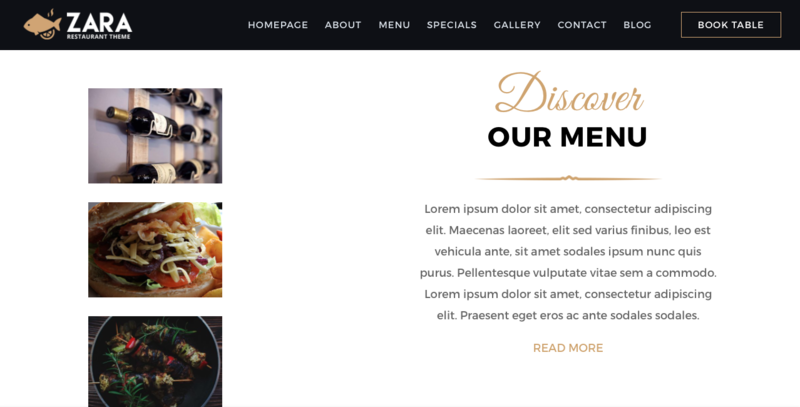 Technically, most Divi child themes could be re-engineered to fit a blog theme template style, but that might require a little bit of elbow grease, and that’s not really the point of purchasing a child theme in the first place. 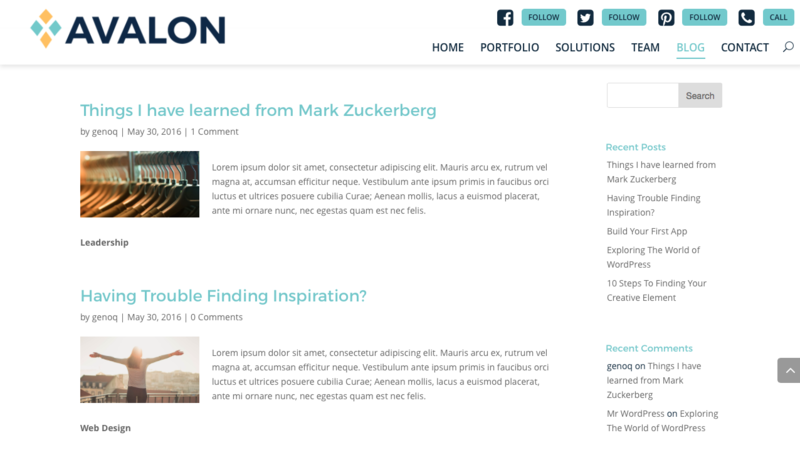 The following child themes really focus on leading a web presence with blog content. 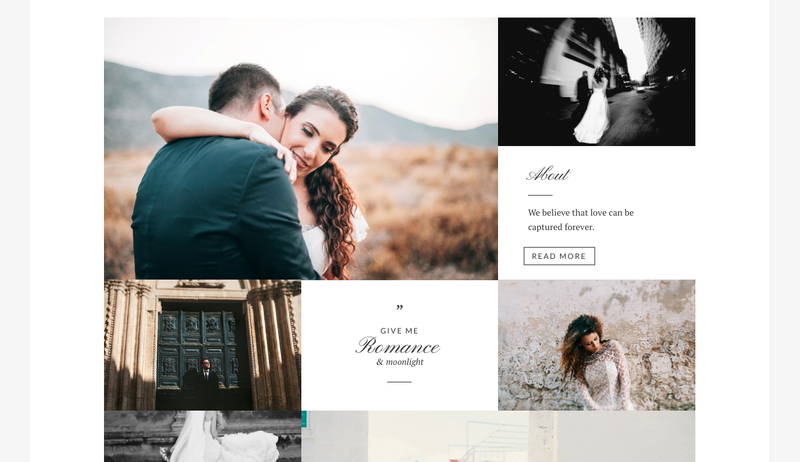 Engage by Sunflower Child Themes uses a really unique set up to show off blog content. 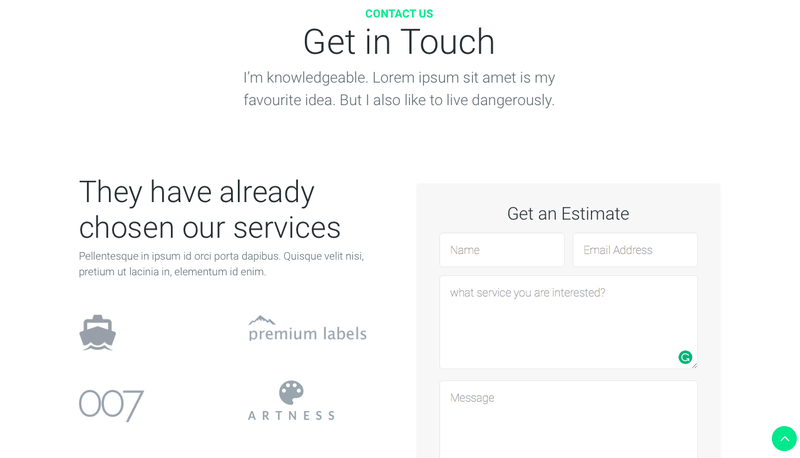 With a bold opt-in form just resting below the full-width image on the Home page, readers are instantly given a chance to sign up for a newsletter. 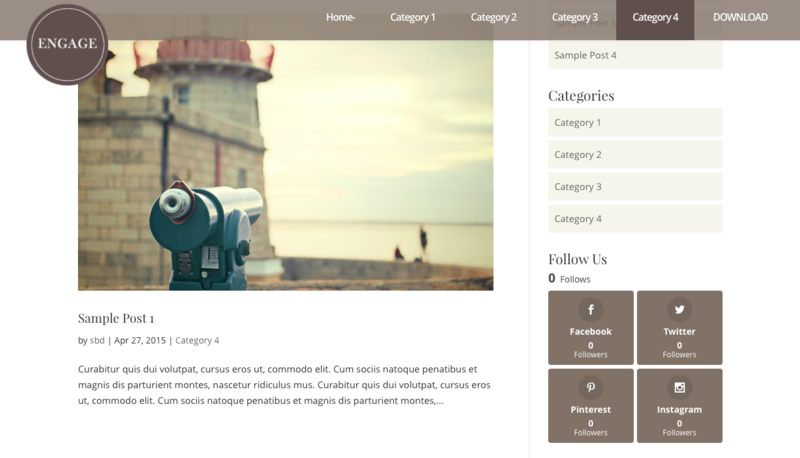 Following this, four large images display prominent blog categories that are hyperlinked off to respective pages and show a selection of category related posts. 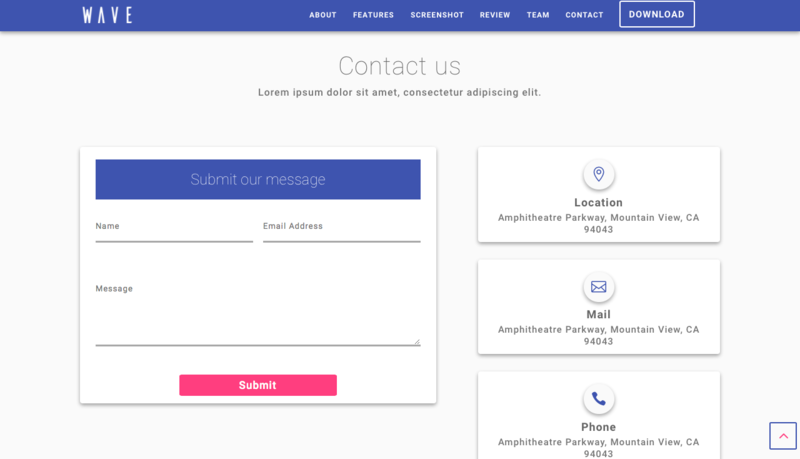 This is a really great way of structuring and highlighting you or your client’s most prominent post forms, and too, creating a hierarchal structure for both visual and text content elements. 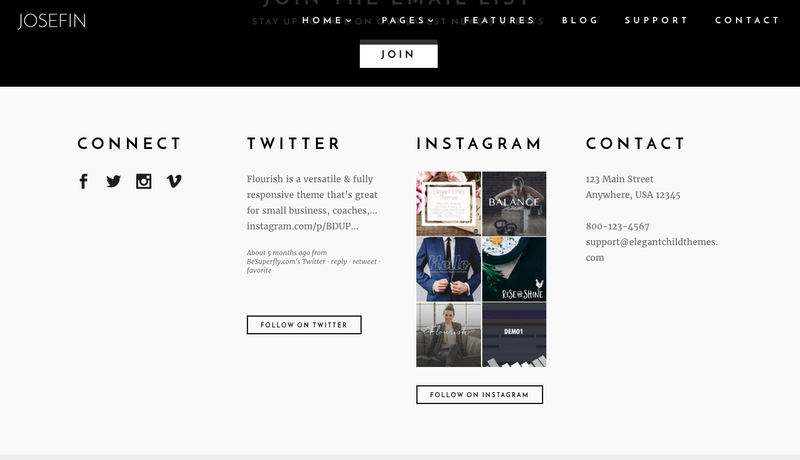 Within the blog, the sidebar is styled to include an opt-in form as well as a really neat social follow section. 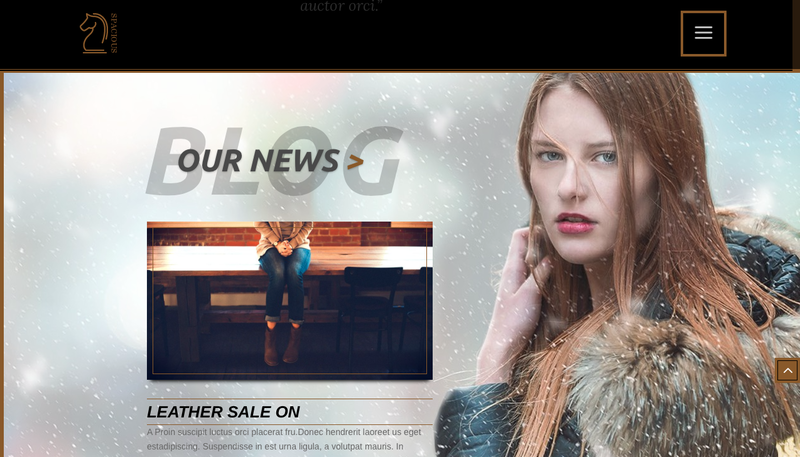 View the Engage Demo or purchase it from Sunflower Child Themes for $ 40.00. 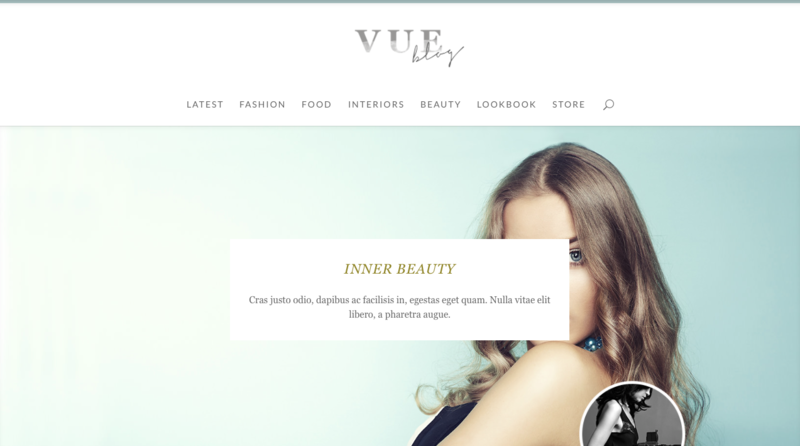 Vue by The Design Space Co.
Melissa Love of The Design Space Co. is infamous for making exquisite child themes, and Vue is a perfect example this. 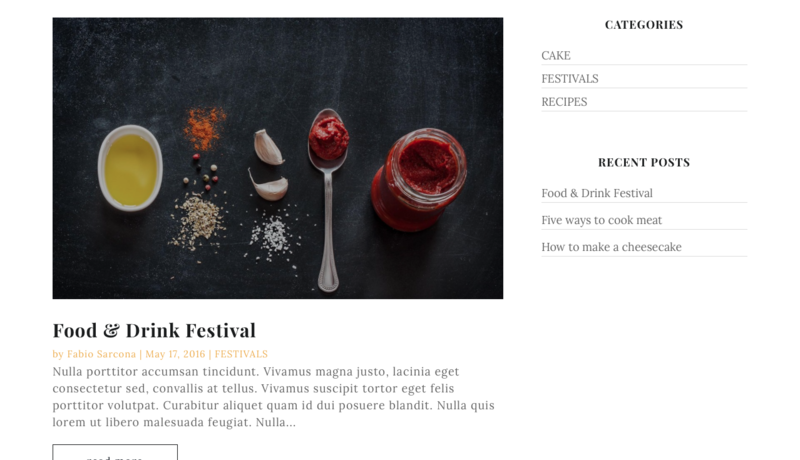 Making use of both a primary and secondary menu, Vue prioritizes the categorization of blog post topics while still allowing readers to access important information (such as the About and Contact pages) without distracting them from the core premise of the web platform’s blogging purpose. 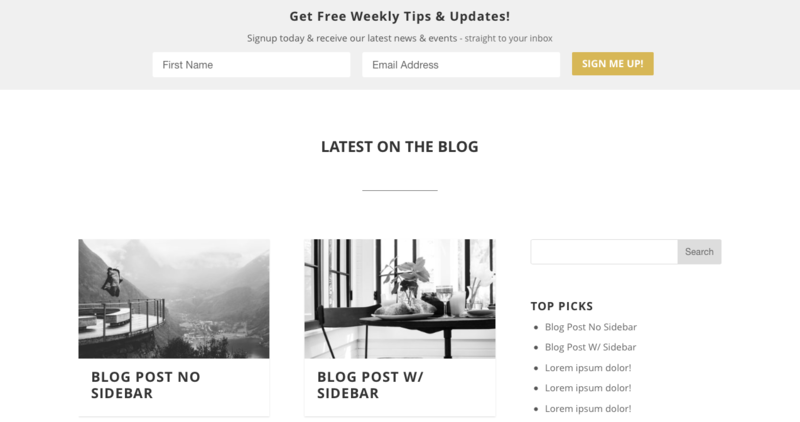 Vue includes a beautifully designed sidebar – styled to include social links and advertisement space – that reflects site-wide (bar the About and Contact pages) to allow for easy access to related blog posts and tags. 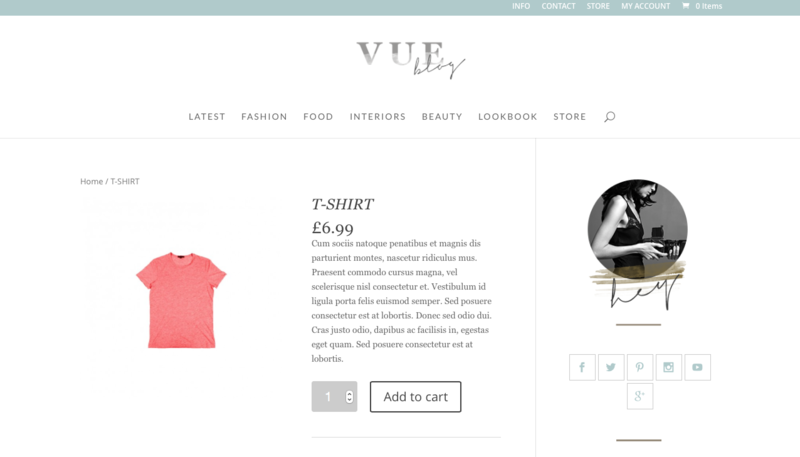 Finally, Vue is e-commerce ready and integrates seamlessly with WooCommerce, which is truly perfect if you or your client are avid bloggers that are wanting to sell a few products on the side. 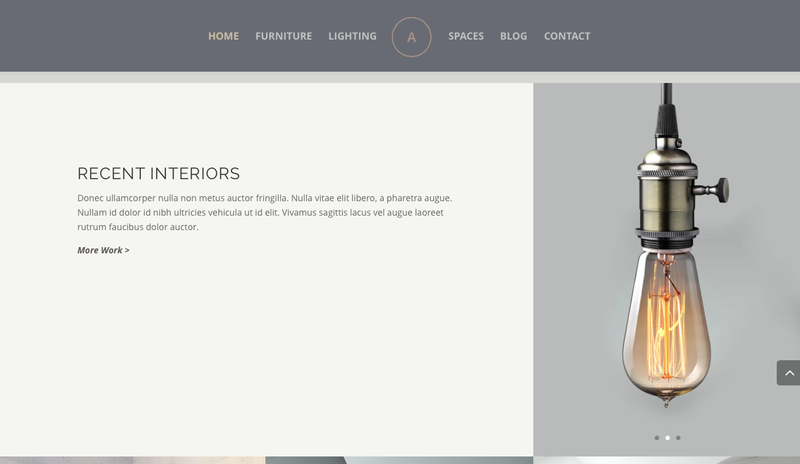 View the Vue Demo or purchase it from The Design Space Co. for $ 95.00. 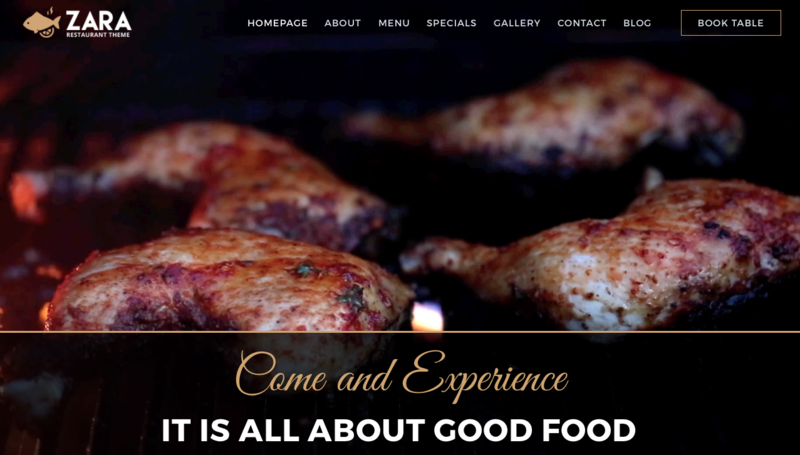 The food industry has been, is, and will continue to grow from strength to strength, and so, an amazing dining experience should definitely have an amazing website to accompany it. If you’ve just landed a client in the food and/or beverage industry – be it a bar, a restaurant, a cafe, a food truck, a bistro, a super trendy gastronomical pop-up concept store or similar – look no further than these three incredible child themes. 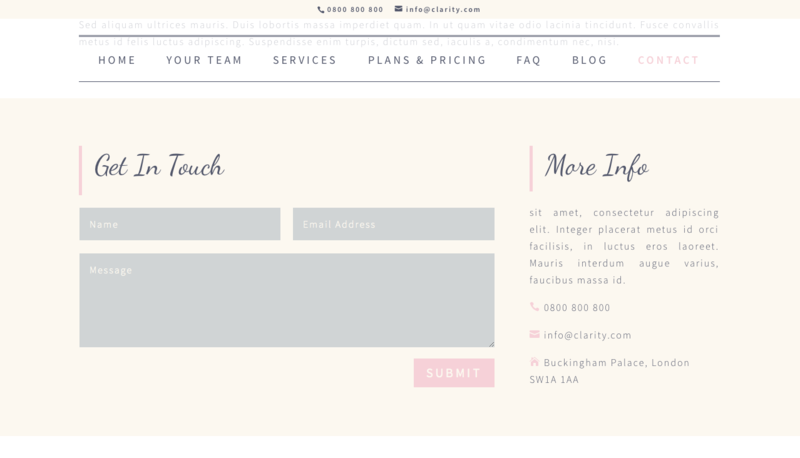 Also, if you have a client, not necessarily in the food industry, but who’s service offerings could make use of a menu element or categorized price list (possibly a spa or beauty salon), have a look at these three Divi child themes as there might be some great design aspects and functionalities built into these themes that would work perfectly. 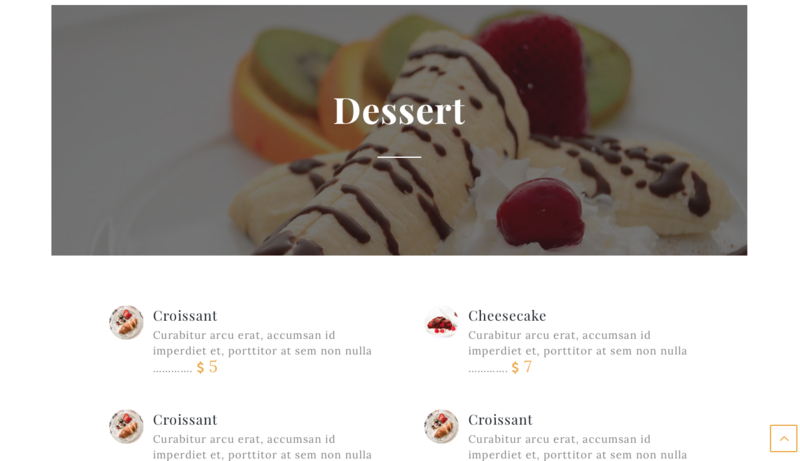 Possibly one of the greatest restauranteering-related Divi child themes available right now is Foody by Creative Child Themes. 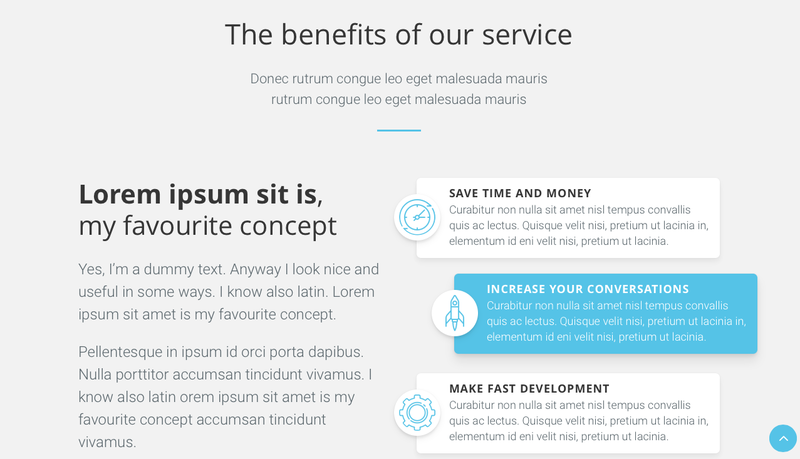 Even the demo imagery makes me want to dash out to the nearest tapas bar and bat my eyelids at the chef. 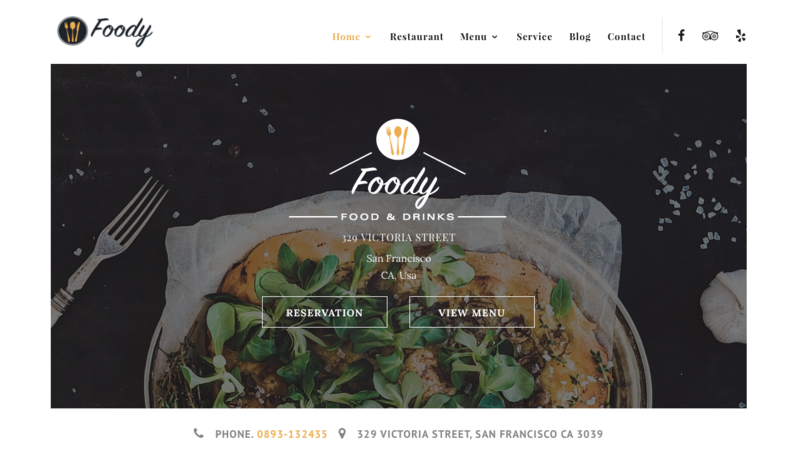 Foody is so well designed that practically every aspect of building a restaurant site is already taken care of, and beyond that, the minimalistic layout, subtle module animations and interesting use of typography render this Divi child theme in a league of its own. 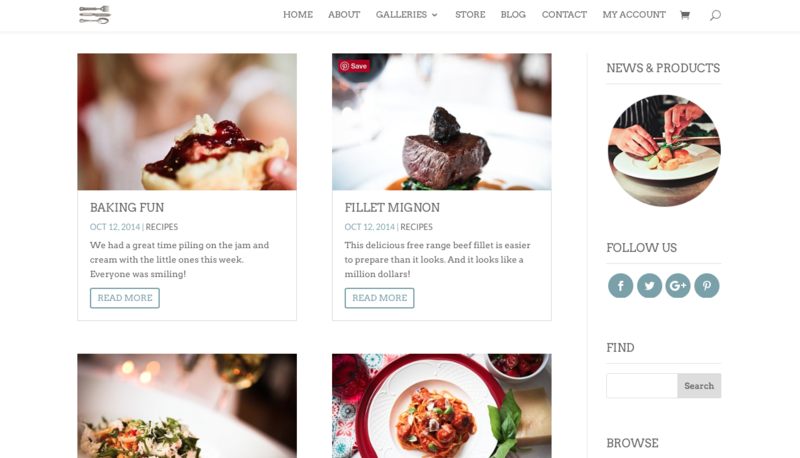 Foody includes two Home page options as well as two alternate display options for the menu (I personally love the grid format). 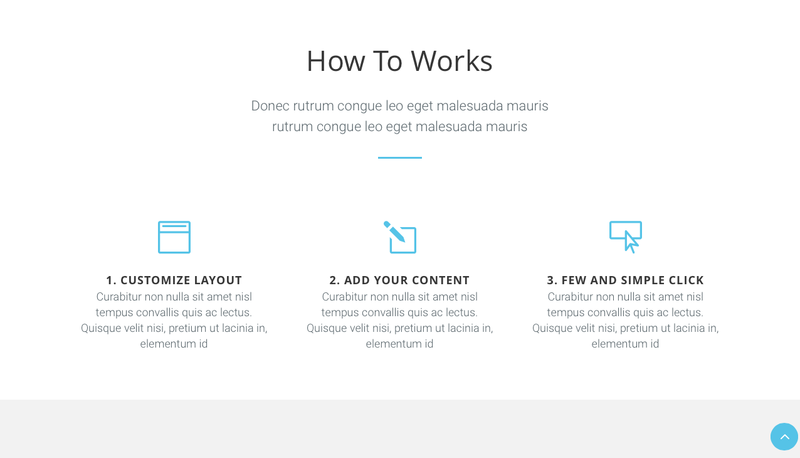 With this, you have plenty of options to decide how to best display your client’s content. 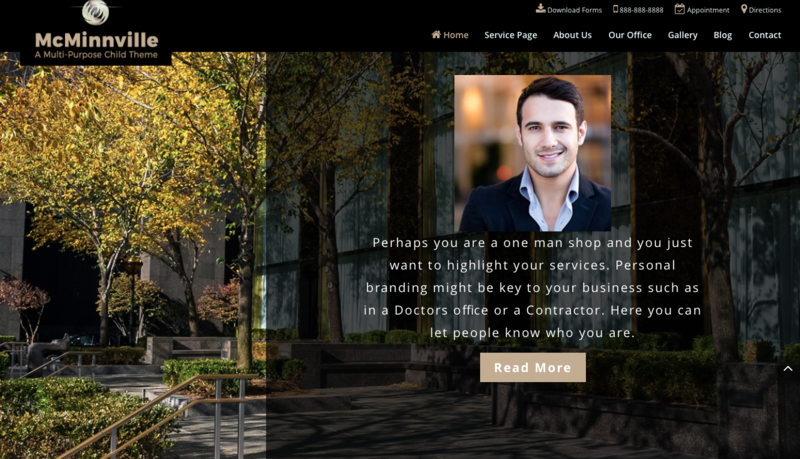 Finally, Foody includes a ‘Services’ section where, if your client offers any additional services outside of the realm of standard restauranteering (i.e. 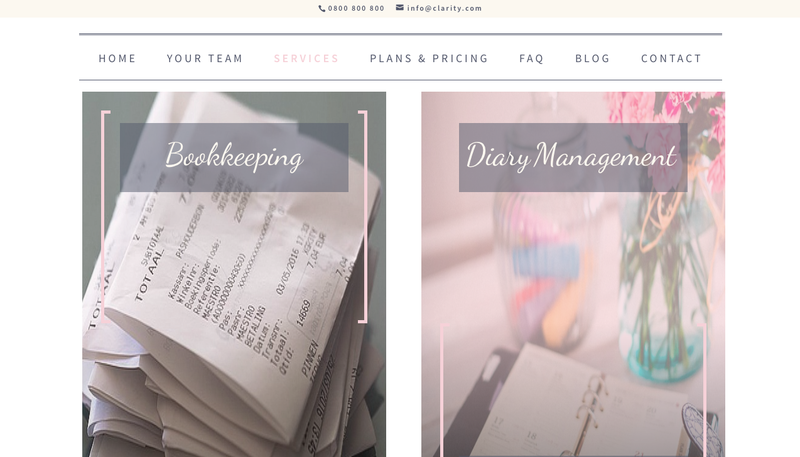 catering of specialized events), you can simply add these services here as opposed to stressing about creating a whole new page. 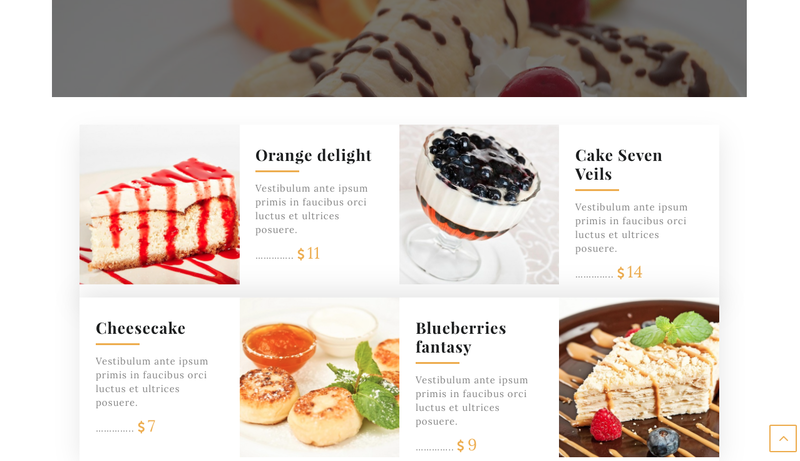 View the Foody Demo or purchase it from Creative Child Themes for $ 97.00. 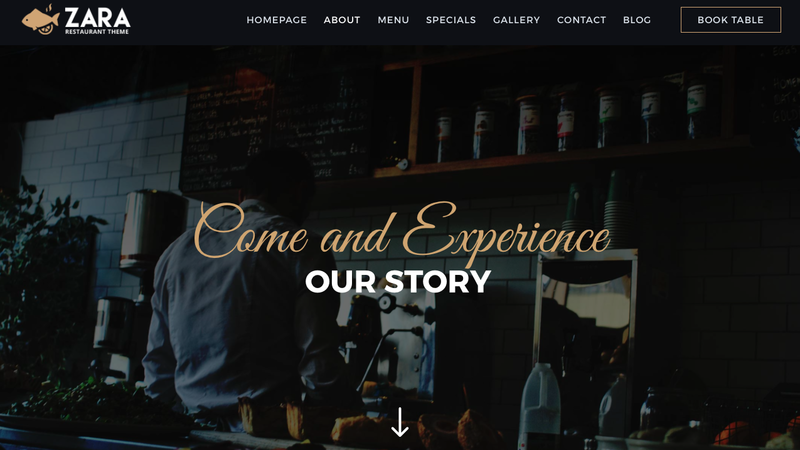 Another great theme designed for bars, restaurants, bistros or cafes is Zara by B3Multimedia. 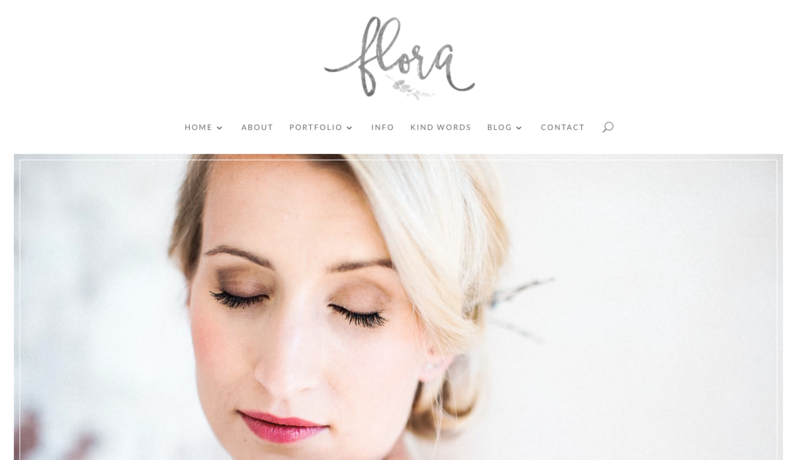 Making use of full-screen images throughout the site, Zara will allow you to really show off your client’s product shots and truly entice the end web user to make a booking. 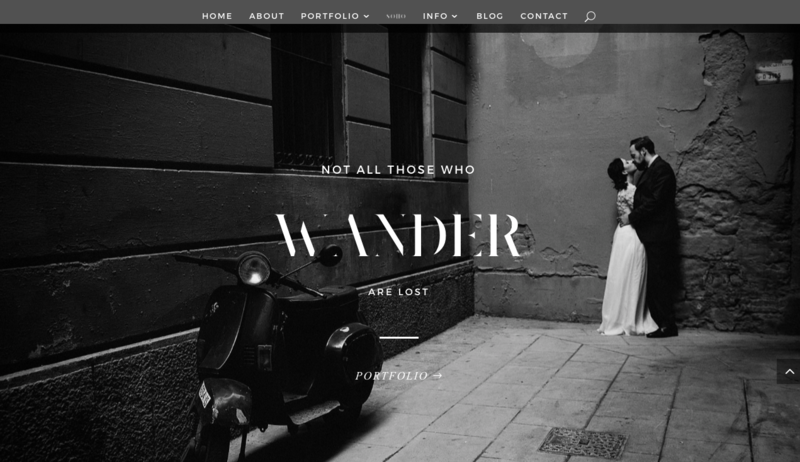 Subtle animations across the theme give Zara a touch of extra flair, while the overall slick design – which teams high contrasting sections with a muted accent color and great font pairings – give this child theme a sense of vibrancy and elegance. 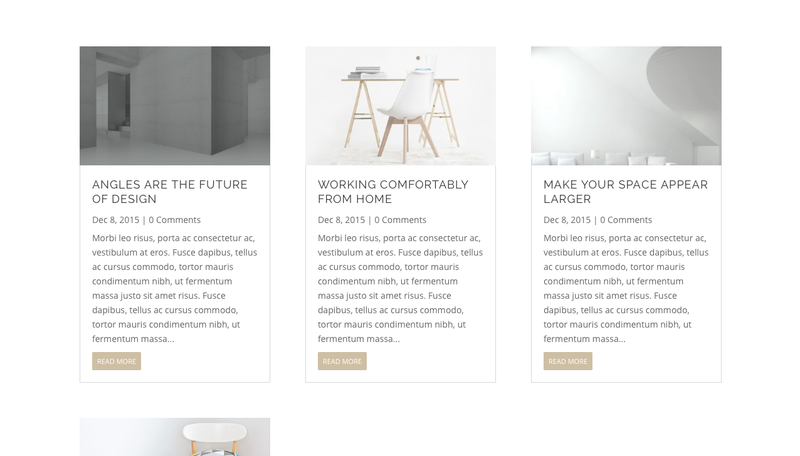 Zara includes two blog page layouts (list and grid) which, together with the sidebar, have been styled out superbly. 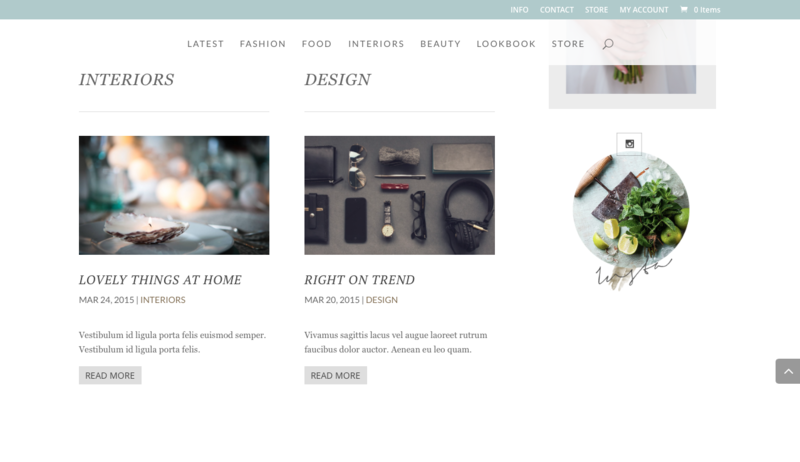 Finally, what makes Zara so great is the level of thought and planning that’s gone into this build, and throughout the site, there are nuances that will really assist a web developer with planning and placing content. 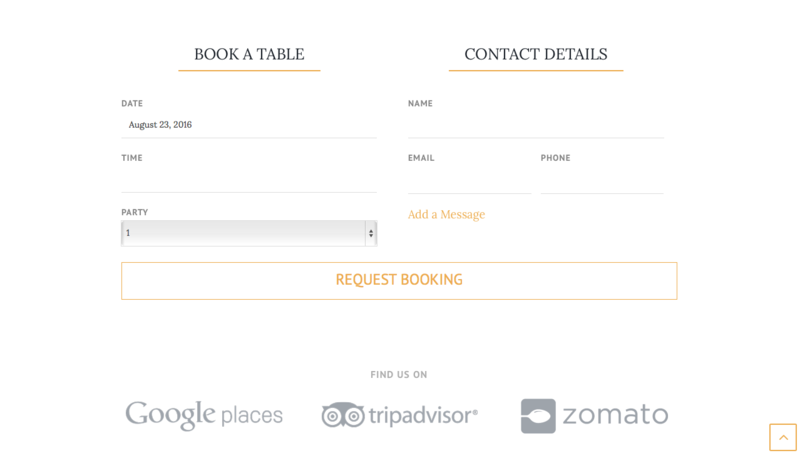 By simply adding a FAQ module before the contact form on the Contact page, final users of your client’s website might be able to resolve a query before needing to send a mail to your client, and too, the CSS-styled menu item of “Book Table” just works so well in terms of web UX design, as final site users will be able to make a reservation practically at any time while browsing the site. View the Zara demo or purchase it from B3Multimedia on sale now for $ 96.00 (valued at $ 120.00). 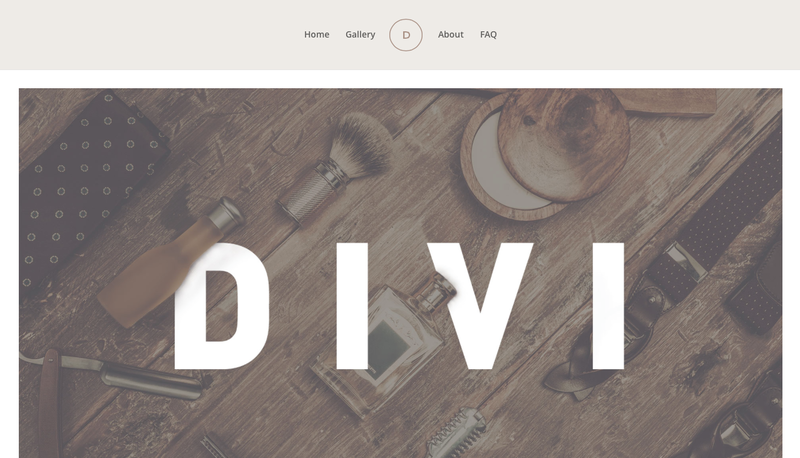 Another stellar Divi child theme by the team at Superfly is Rise and Shine. 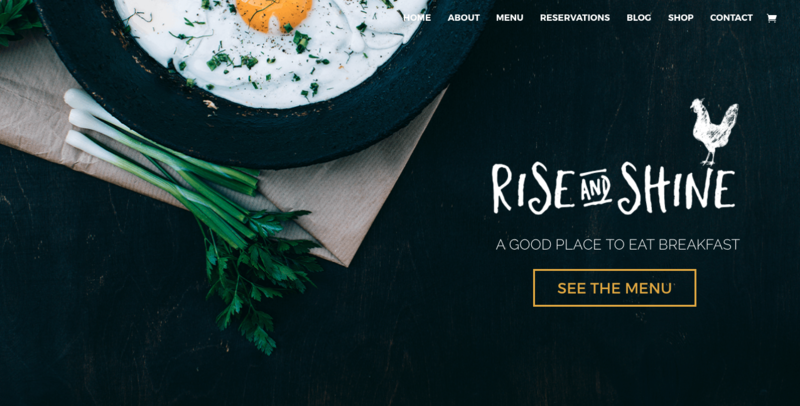 Designed by Carrie Green and developed by Gruffy Goat, Rise and Shine is a perfect child theme to fit either bars, restaurants, cafes and similar. 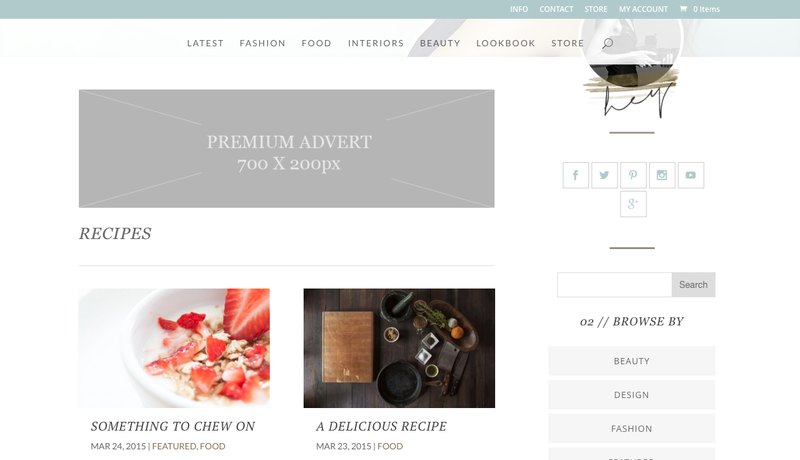 With a slightly less flashy design as Foody or Zara, Rise and Shine has a more quirky, relaxed and edgy feel to it. As well as the overall great design, Rise and Shine includes some incredible features and awesome animations. 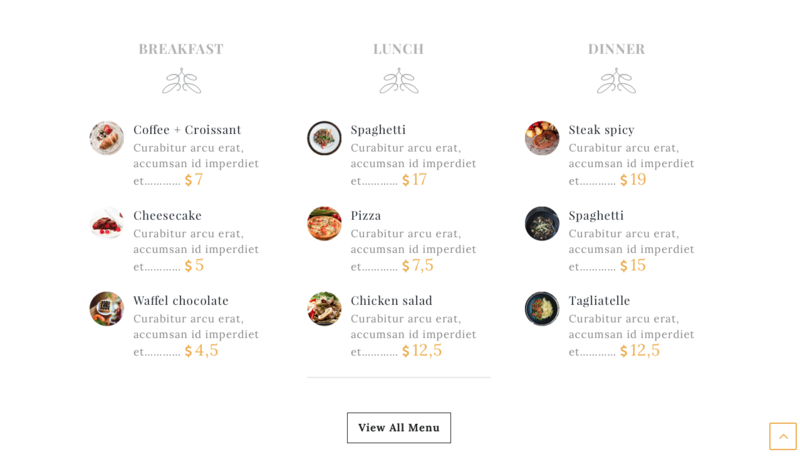 The Menu tab in the navigation bar offers a drop down list of various menu categories. 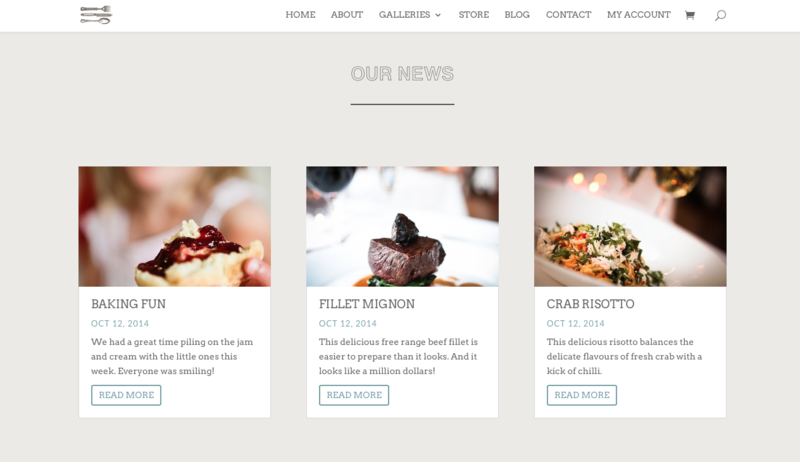 These are anchor links that scroll dynamically to various sections on the page, where a large image shares the screen with a short blurb of text in representation of various sections on the food menu. 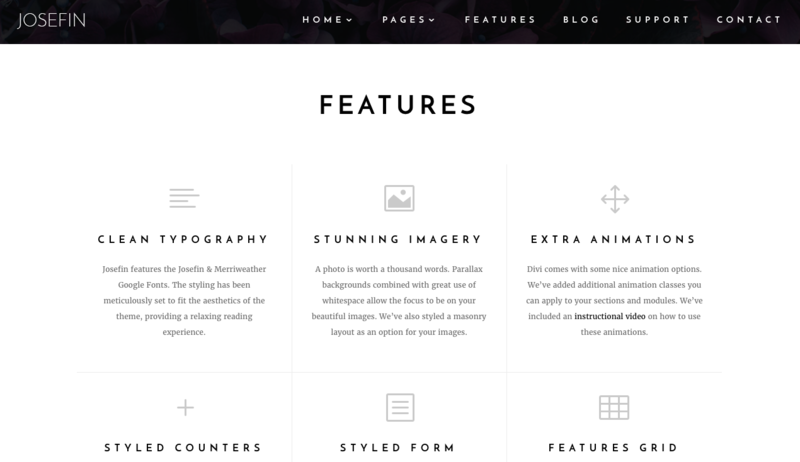 When clicking the ‘View Menu’ button, a super-slick animation shoots forth the specific section of the menu, which can be hidden again if desired. 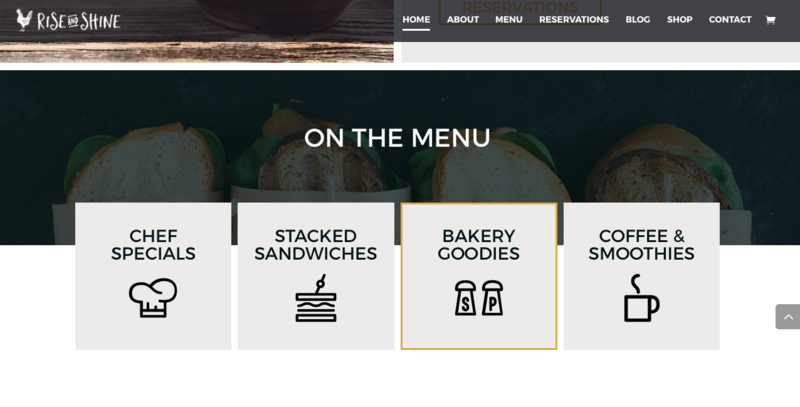 Each of these sections follows suit, and after clicking through all of the ‘View Menu’ buttons, the end user is left with the client’s full list of food and beverage offerings. 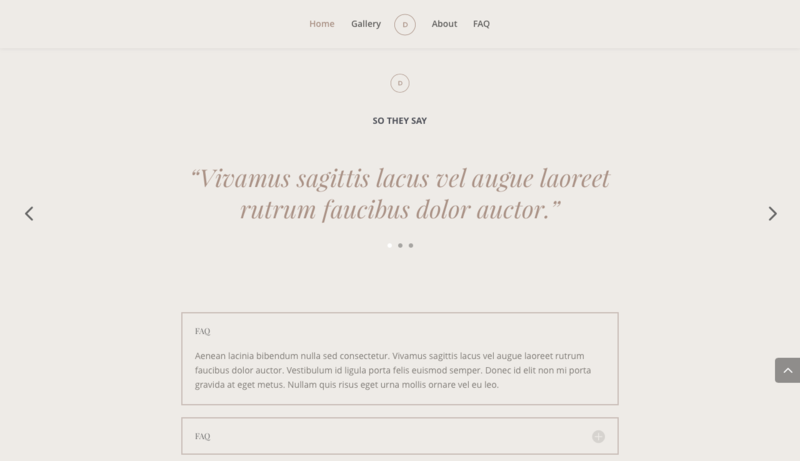 This works particularly well on mobile as dynamically displaying and hiding sections takes away from the need to show a full scrolling list of menu items. 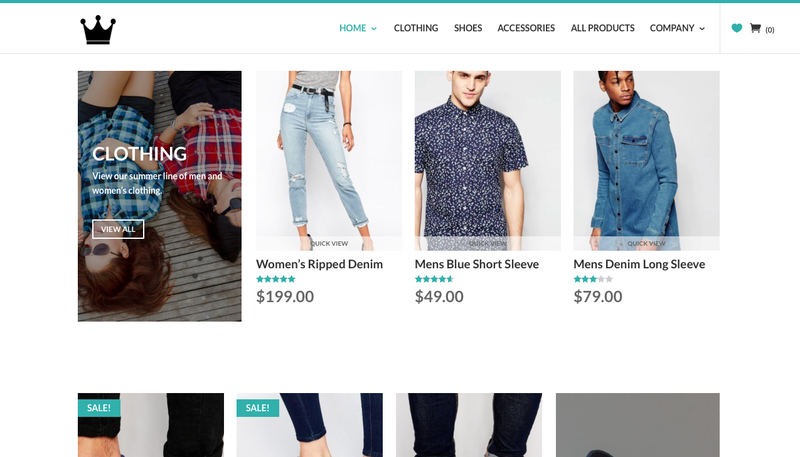 Another epic aspect of Rise and Shine is that it’s e-commerce optimized and can be integrated with WooCommerce with ease. 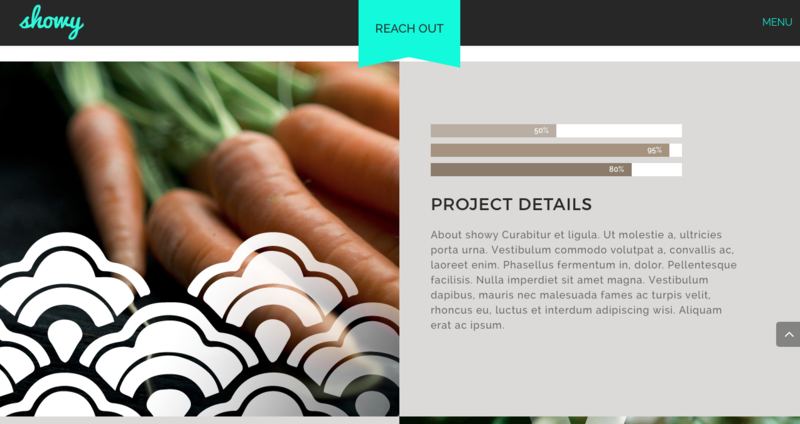 This is awesome if your client is wanting to sell products or produce online. 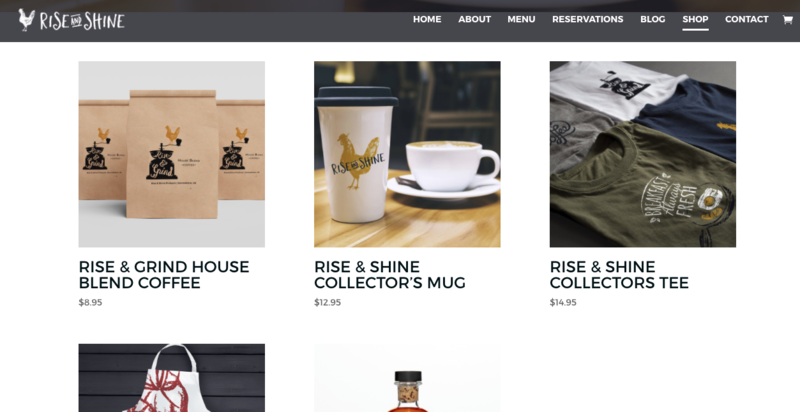 Perhaps they’re a coffee shop that sells coffee beans or coffee makers to the public, or perhaps your client’s bar has a bit of a cult following and you could suggest selling branded apparel through their site. View the Rise and Shine Demo or purchase it from Superfly for $ 75.00. 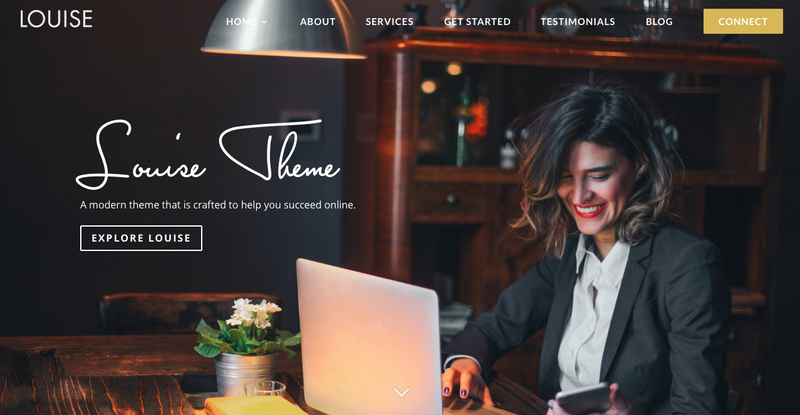 As with most Divi child themes, the customization possibilities are endless, and just about any child theme can be adapted to suit and fit your client’s brand style and business objectives. 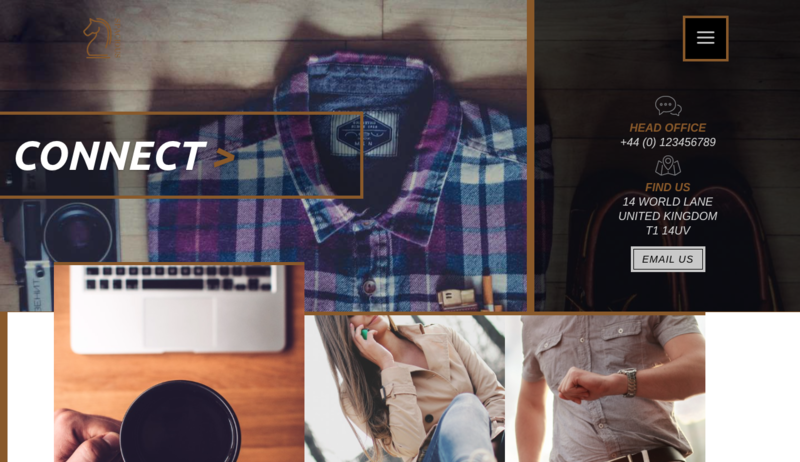 The following Divi child themes have been designed and developed to match perfectly with fashion brands, so if your client is in the greater clothing and apparel market, these will be perfect for your next web dev project. 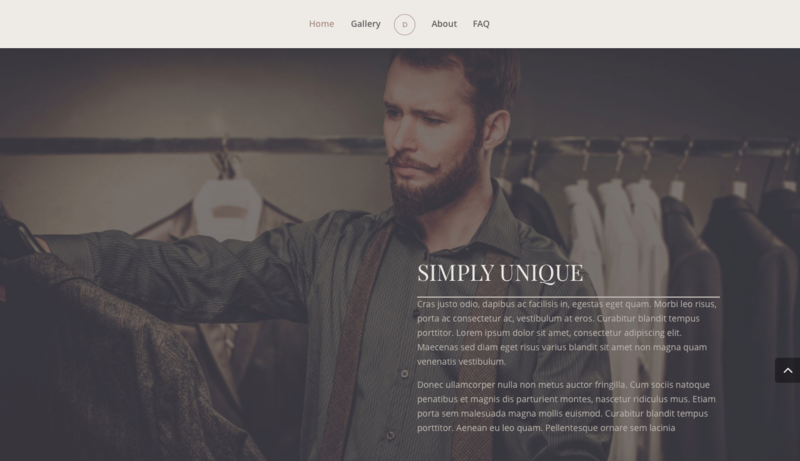 Originally designed by Kenny Sing as one of the demo site examples for the release of Divi 2.4, Fashion has been reverse engineered into a Divi child theme by Aspen Grove Studios. 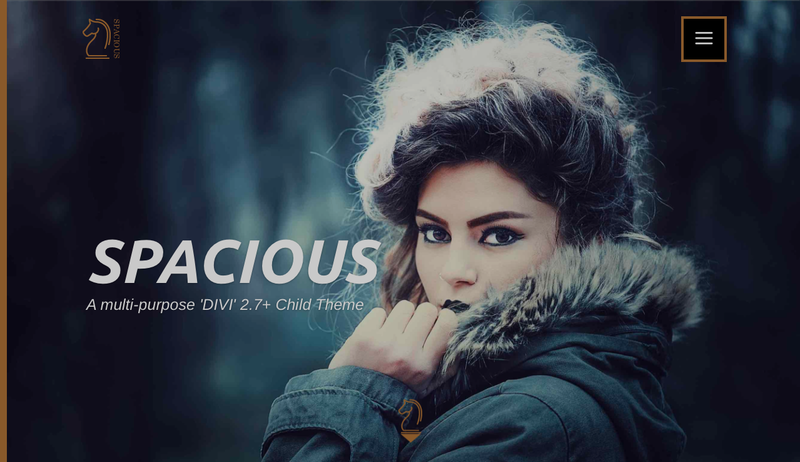 The perfect Divi child theme for boutique stores and fashion brands, Fashion is a one-page website, with anchor links that steer dynamically to various relevant sections throughout the page, and so, is great for displaying content, brand assets and products in a simple yet attractive way. 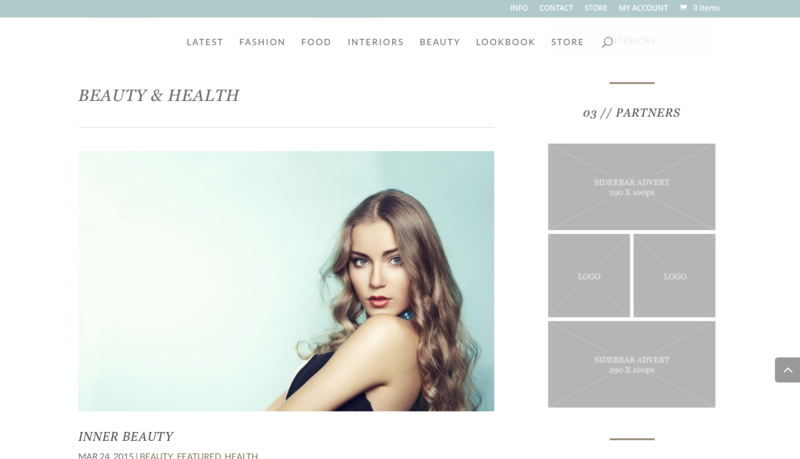 With a great colour palette, perfectly paired typography, excellent use of parallax sections and great product displays, Fashion exudes a truly classic and elegant feel. View the Fashion Demo or purchase it from Aspen Grove Studios for $ 50.00. 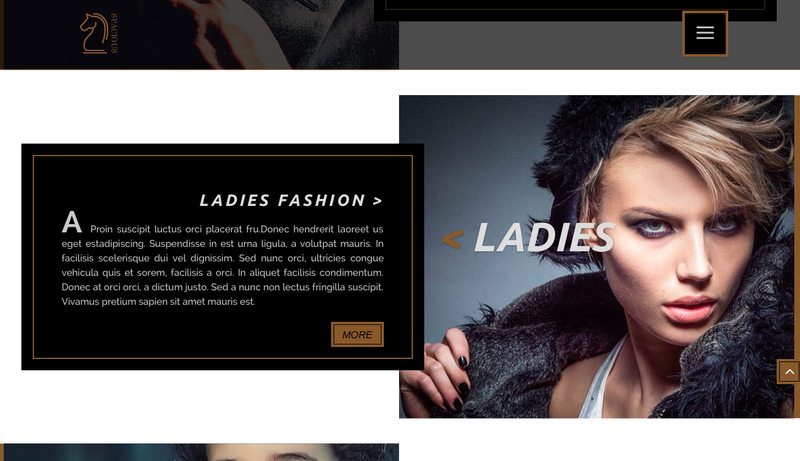 Another great theme designed for fashion and clothing brands is Spacious by Love Divi. 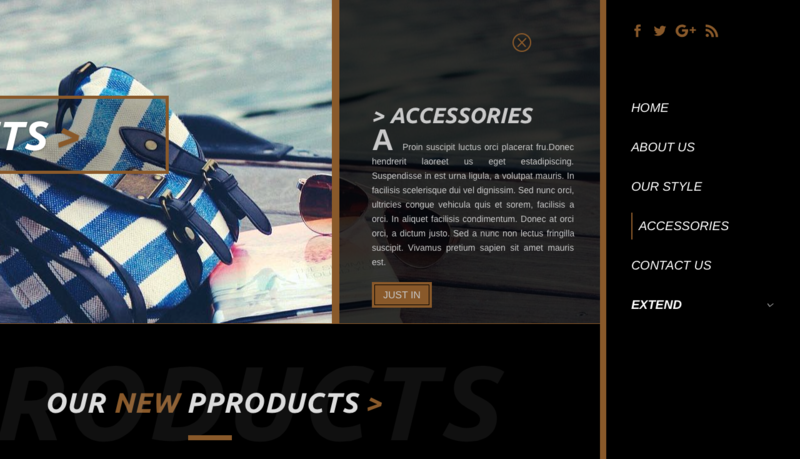 Spacious makes use of plenty image modules – many with great parallax effects – so your client’s products and lookbook shots are bound to stand out. 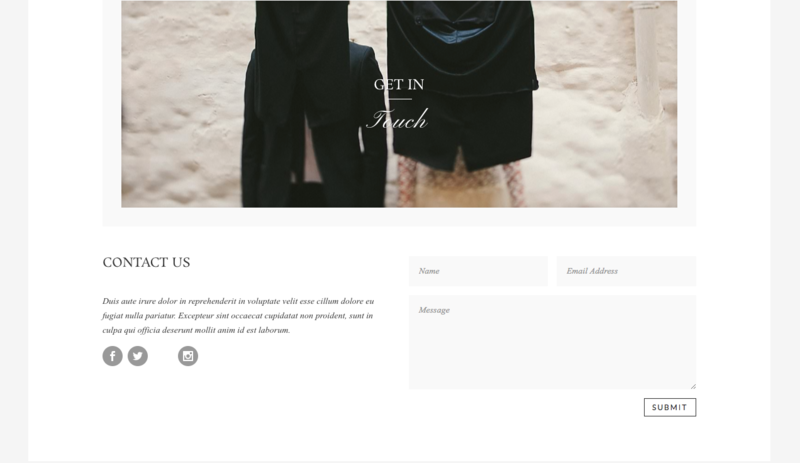 Also, the child theme includes various content rich areas for entering text, as well as neatly structured category-type sections that can display your client’s product collections or groups really nicely. 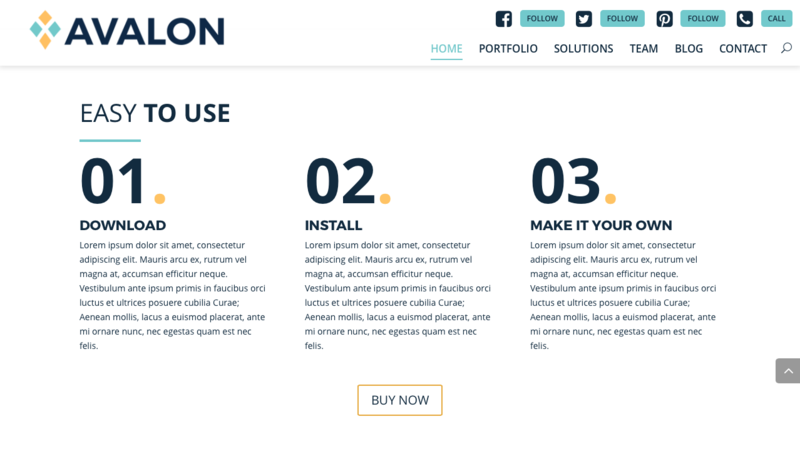 Spacious includes two alternate Home page options – a standard home page as well as an extended home page which allows for additional content areas. 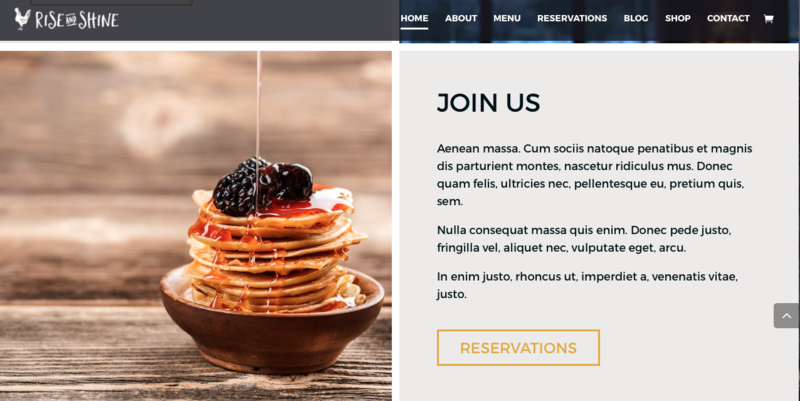 A right-side fly-in menu bar includes easily accessible social icons so that the end users of your client’s website will be able to find and follow their social pages with ease. View the Spacious Demo or purchase it from Love Divi for a special sale price of $ 50.00 (valued at $ 75.00). 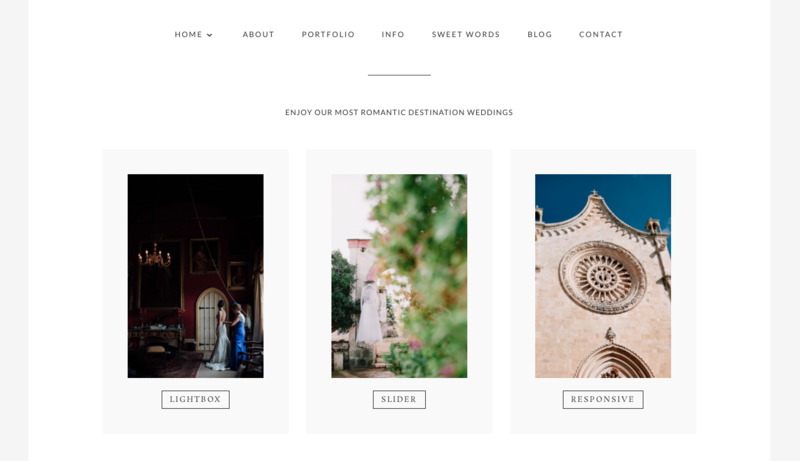 If you or your client are active and involved in one way, shape or form with the visual communications industry, then a portfolio or showcase website is a must-have for the brand. 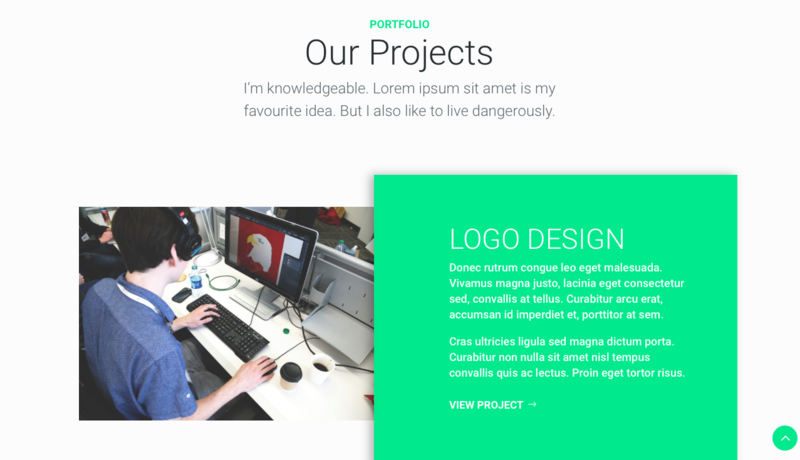 Through the use of simple layouts, clean typography and a slew of image ready sections, the below listed Divi child themes are perfect for clients wanting to showcase work items or portfolio pieces – and are suitable for artists, photographers, designers, creatives or even communications agencies. 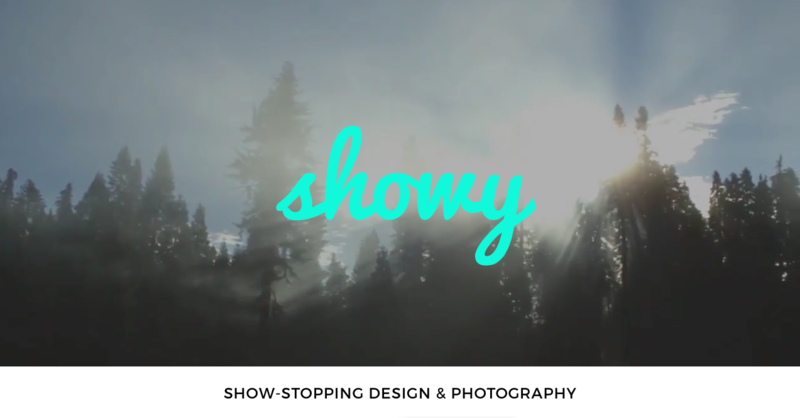 View the Showy Demo or purchase it from Superfly for $ 35.00. 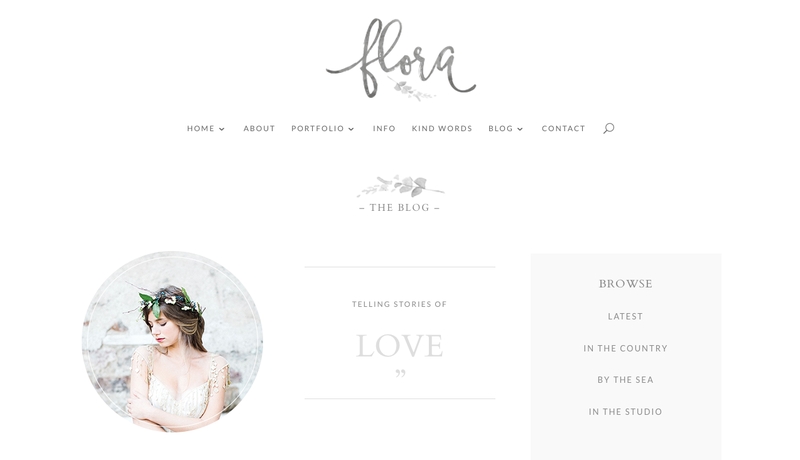 Soho, Flora and Venezia by The Design Space Co. 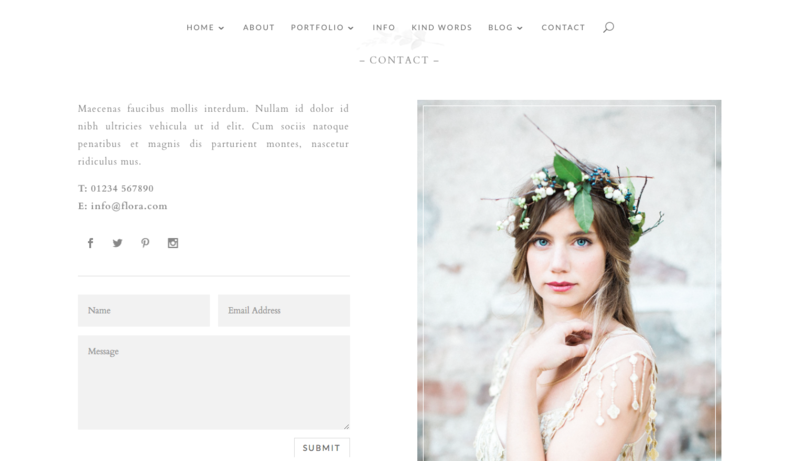 Without a doubt, one of the most talented Divi child theme developers is Melissa Love from The Design Space Co. With a strong focus on providing web products to the niche photography market, Love continues to release scores of Divi child themes that optimize imagery and allow freelance and independent photographers to really showcase their work in style. 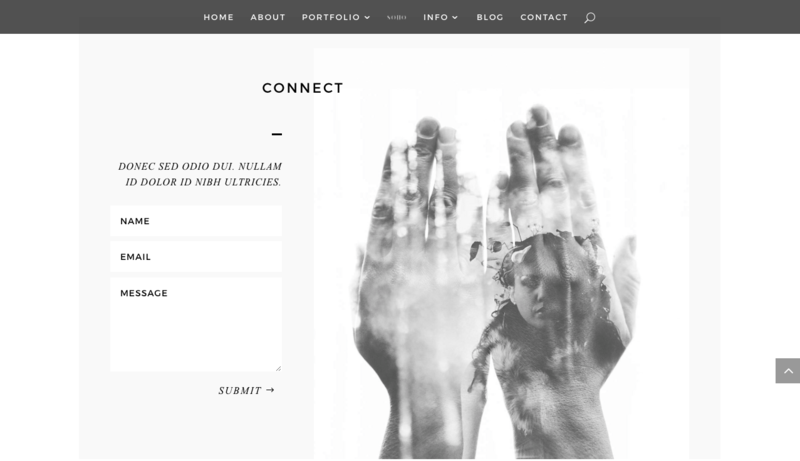 Generally, her child themes appear minimalist in construction, and through the use of monochromatic color schemes and white space, her child themes really allow for a photographer’s work to stand out. 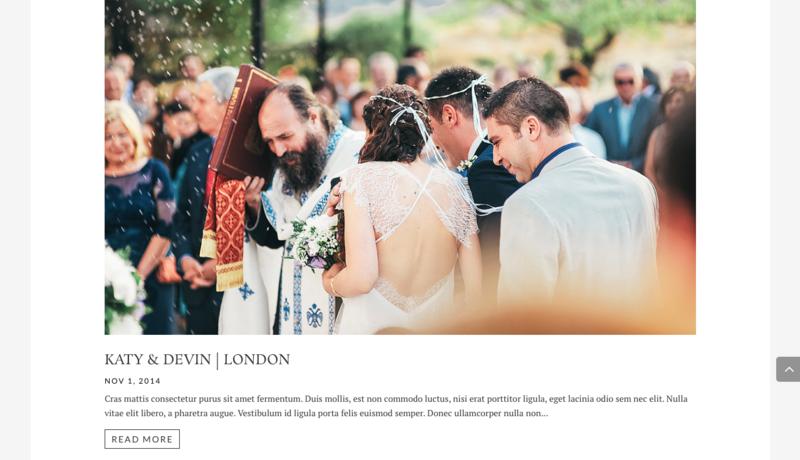 From captivating layouts to flawless type pairings, Love really embellishes the Divi native modules with carefully planned CSS styling to produce truly unique child themes. 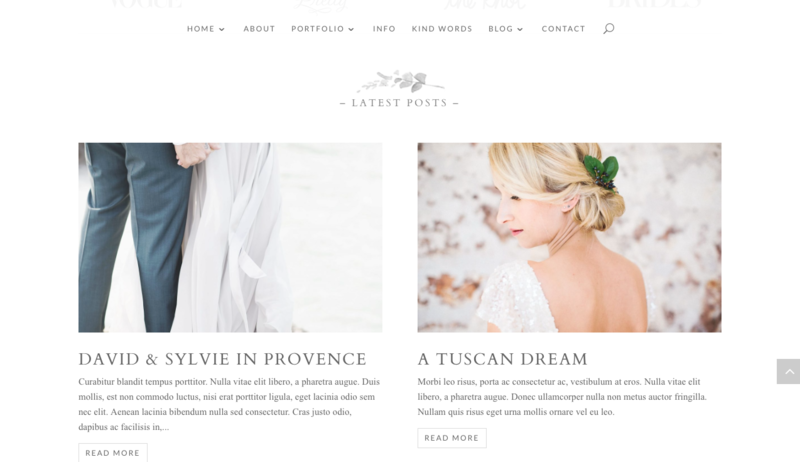 The Design Space Co. sells a number of Divi child themes, three of which – Soho, Flora, and Venezia – are listed below. 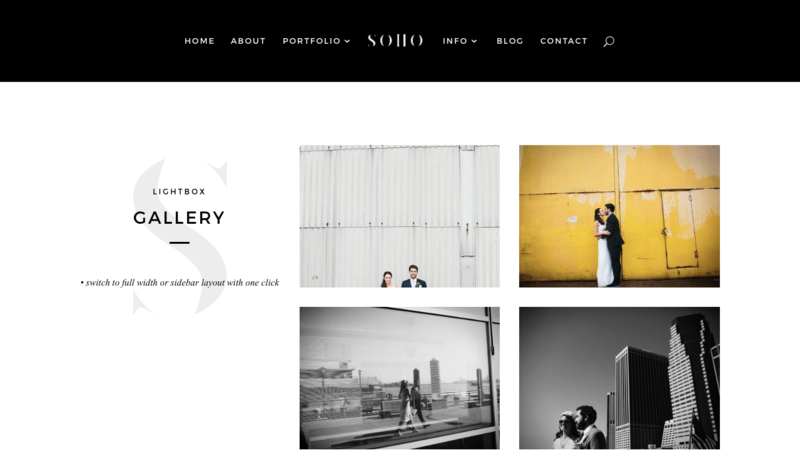 Although her themes are largely aimed at the niche photography market, they can be adapted to suit any brand or business, so definitely have a look at her full body of work – you won’t be disappointed. 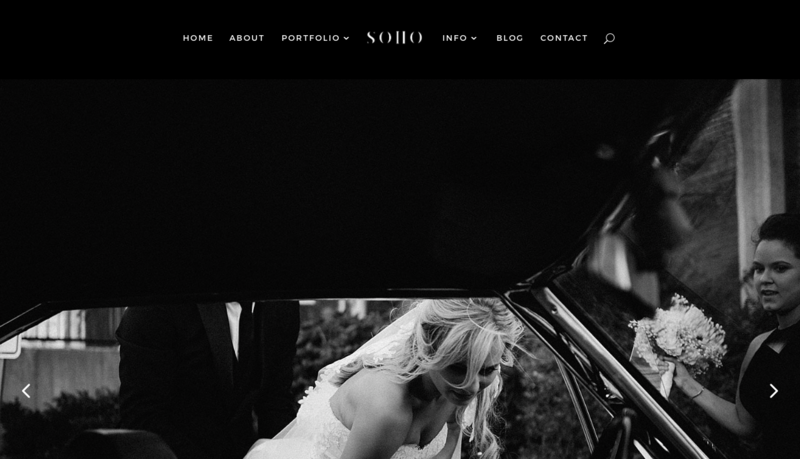 View the Soho demo or purchase it from The Design Space Co. for $ 95.00. 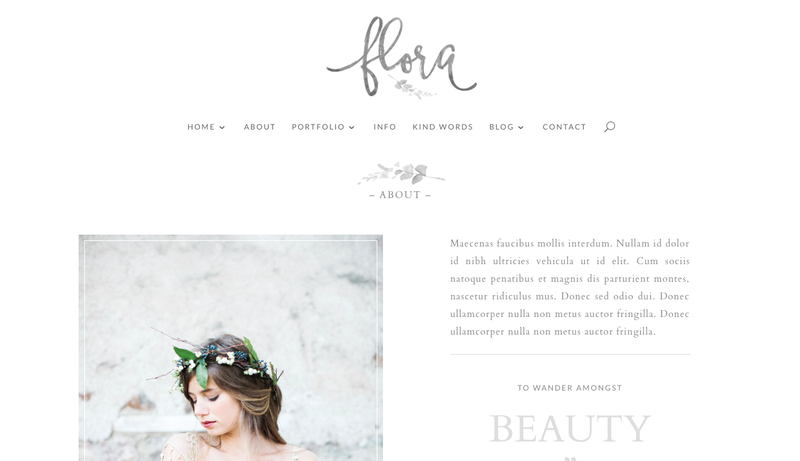 View the Flora demo or purchase it from The Design Space Co. for $ 95.00. 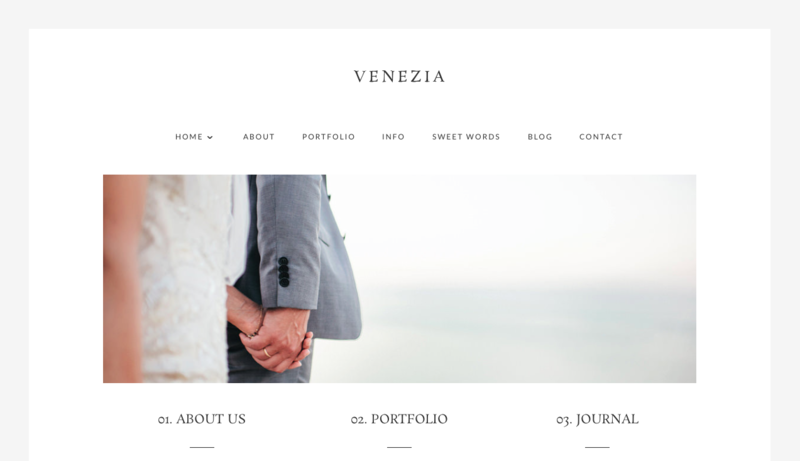 View the Venezia demo or purchase it from The Design Space Co. for $ 95.00. 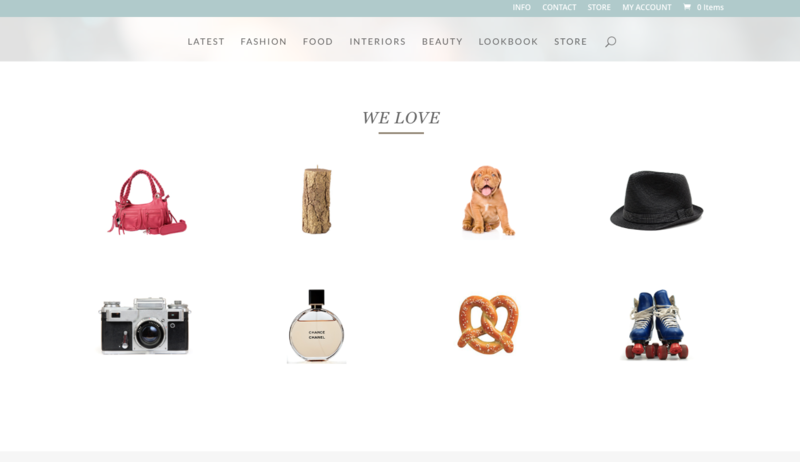 Planning an e-commerce store can be tricky as there are so many factors to consider. 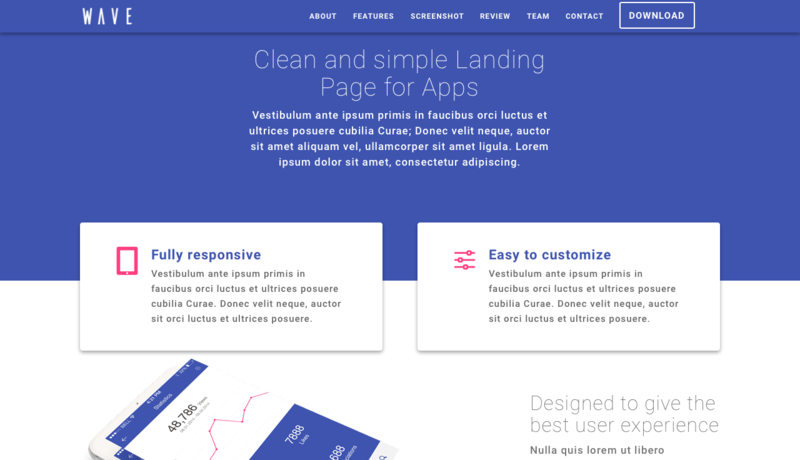 How many products should be highlighted on the home page? 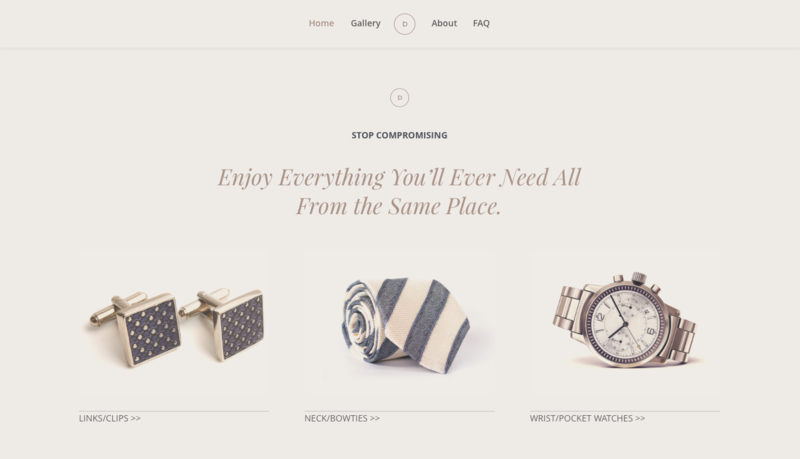 What is the best way to show the categorization of products? How will people browse through catalogs? 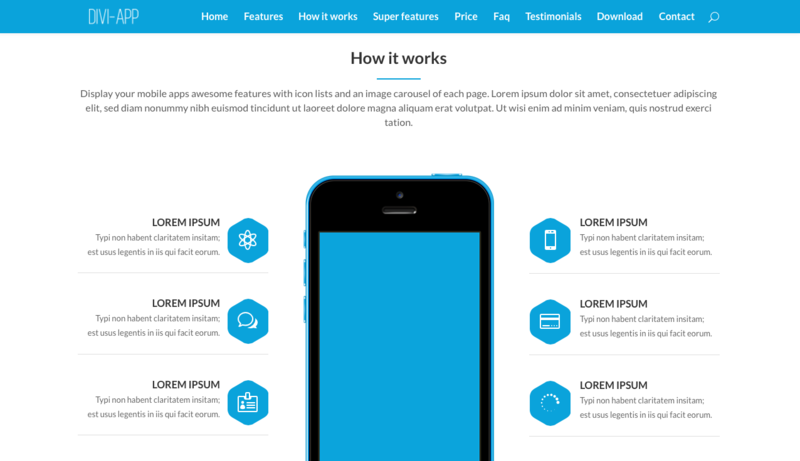 How will the functionality translate to mobile? The list really just goes on and on, and more and more gray hairs might start appearing. 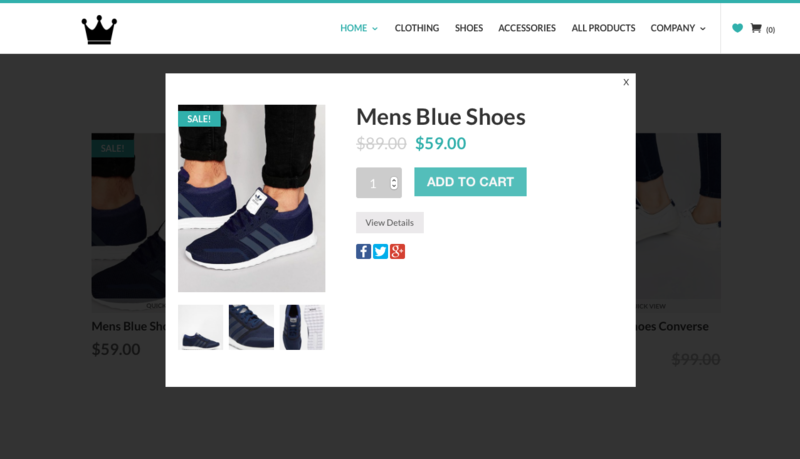 E-commerce and m-commerce are such rapidly growing industries with high levels of competition, so it’s really worth purchasing an already existing child theme to help you along with your web dev process. 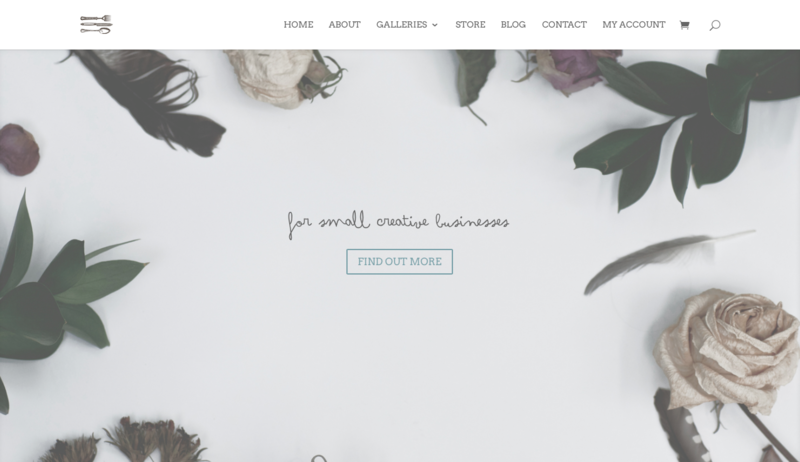 Here, both Royal Commerce and Artisan (listed below) have taken all of the guesswork out of the equation so that you can simply enjoy the process of building a site minus all of the stress. Possibly the single most impressive Divi child theme in existence at this present moment in time is Royal Commerce. 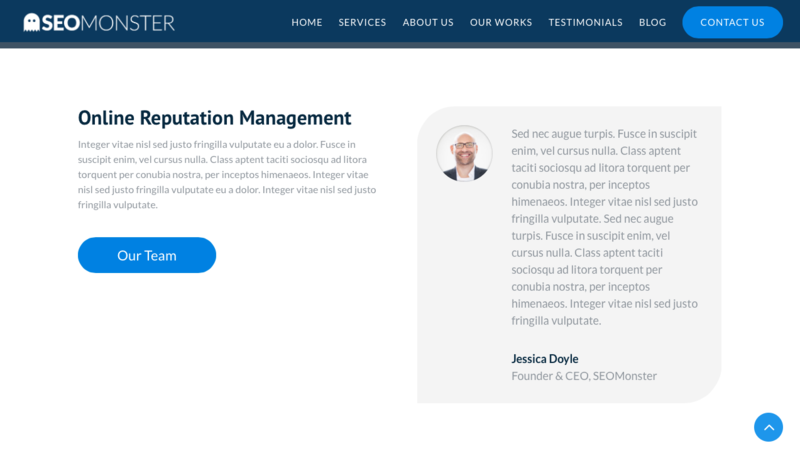 Designed and meticulously developed by Tim Stifler of Divi Life, Royal Commerce is one of the most well planned and researched Divi child themes available on the market. 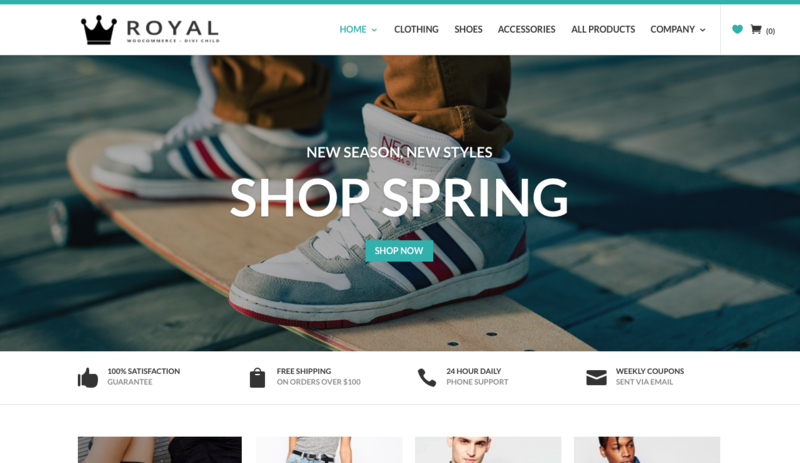 Engineered to include all of the latest, most relevant e-commerce elements and conventions – that translate effortlessly across all media devices – Royal Commerce has a beautiful minimal design that’ll really showcase your client’s products. 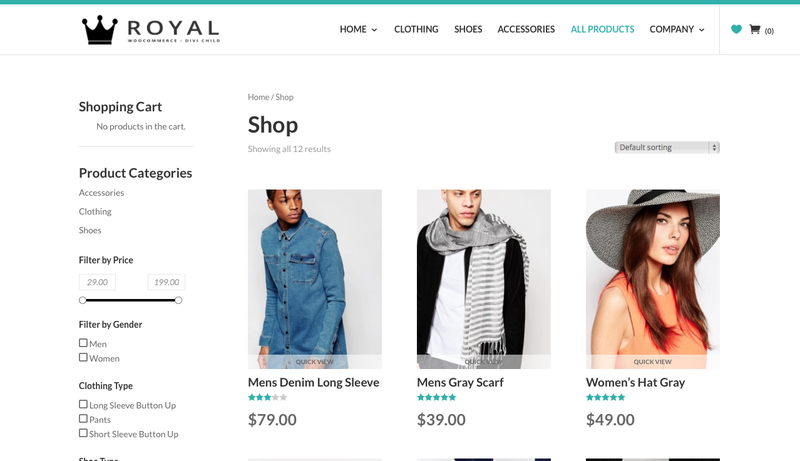 Among an array of other features, Royal Commerce includes an easy quick view for products, a wish-list feature that allows the end users to save desired items for purchase at a later stage, and Ajax-powered filtering options that allow the end users to browse through products with ease. 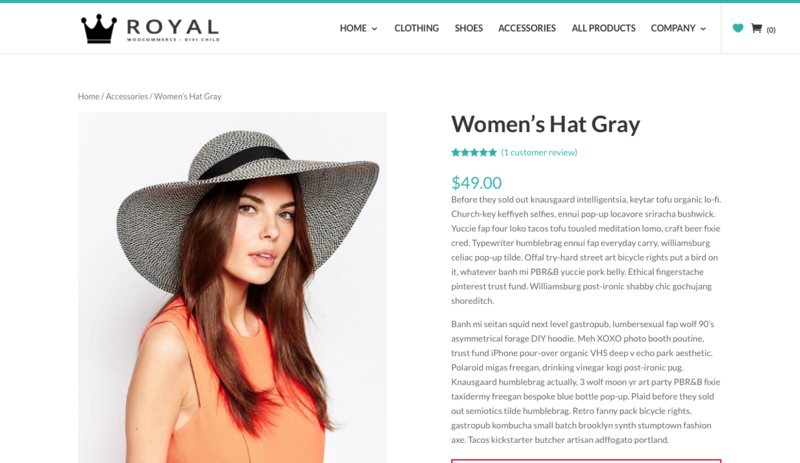 Not only will Royal Commerce present an incredible online shopping experience for your client’s consumers, but it will set the online store on par with other leading e-commerce sites. 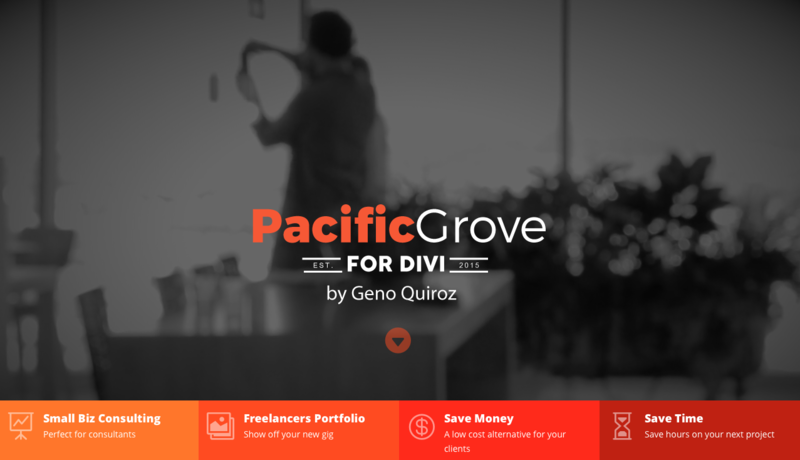 View the Royal Commerce demo or purchase it from Divi Life for $ 150.00. Artisan by The Design Space Co.
Another great release by Melissa Love of The Design Space Co., Artisan is the perfect child theme for any client with a collection of products that are ready to be sold online. 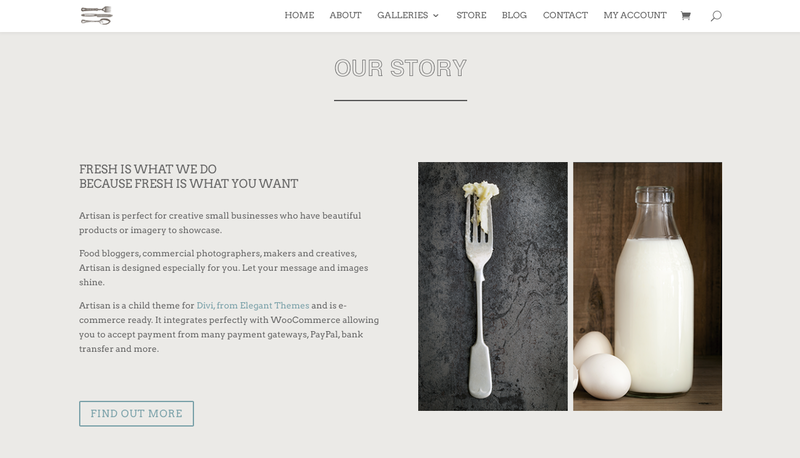 E-commerce optimized and integrated with WooCommerce, Artisan is perfect for photographers, creative entrepreneurs, small businesses and similar. 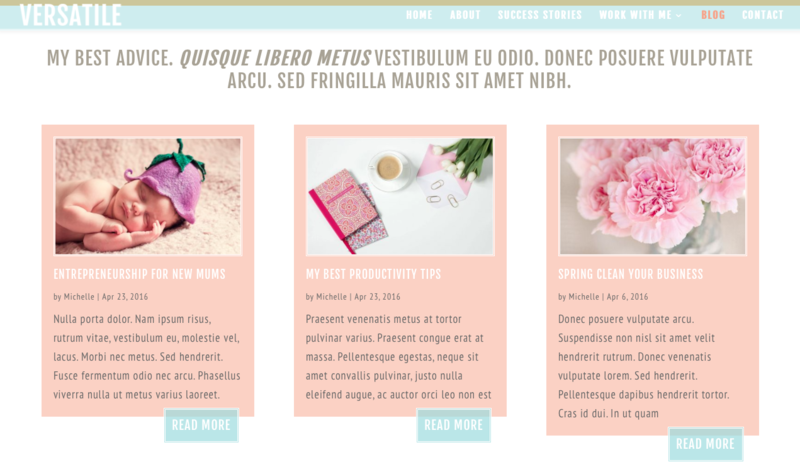 In typical Melissa Love fashion, the child theme has been immaculately designed to include a great combination of design elements (layout, type, form, color palette) that really showcases product and blog imagery. 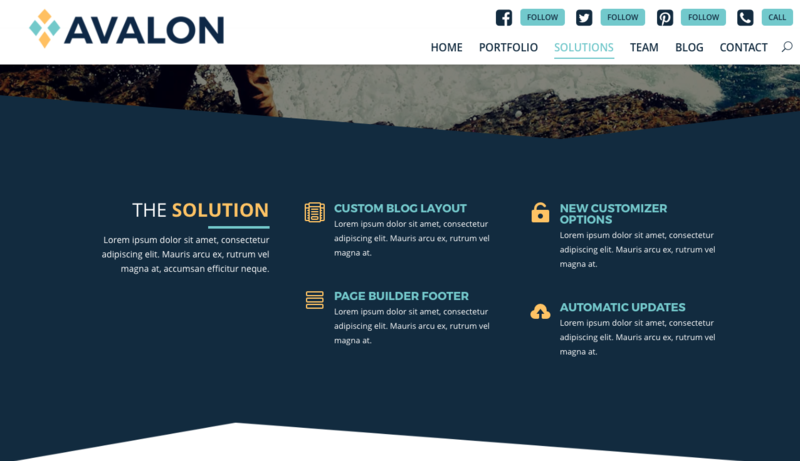 Finally, as the overall design of the child theme is really versatile, practically any brand identity and style guide could suit and fit the theme. View the Artisan demo or purchase it from The Design Space Co. for $ 95.00. 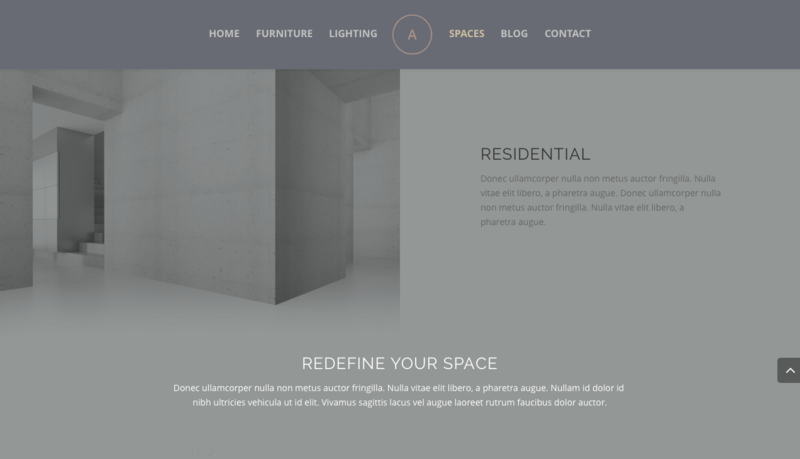 If your next web dev project is for a product designer, an architect’s portfolio or a conceptual space of sorts, have a look at the Interior Divi child theme listed below – it’s full of great design aspects that could really be a source of inspiration for your project. 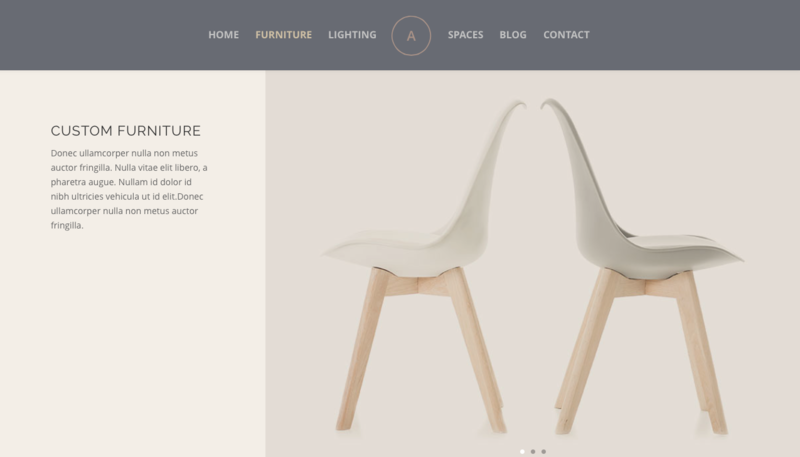 For a product or space showcase website to really stand out, good quality photography is key (especially if products need to be shown as both pack shots and in situ/context), and Interior gives away a few great design tricks to really help you push a client web build to another level. 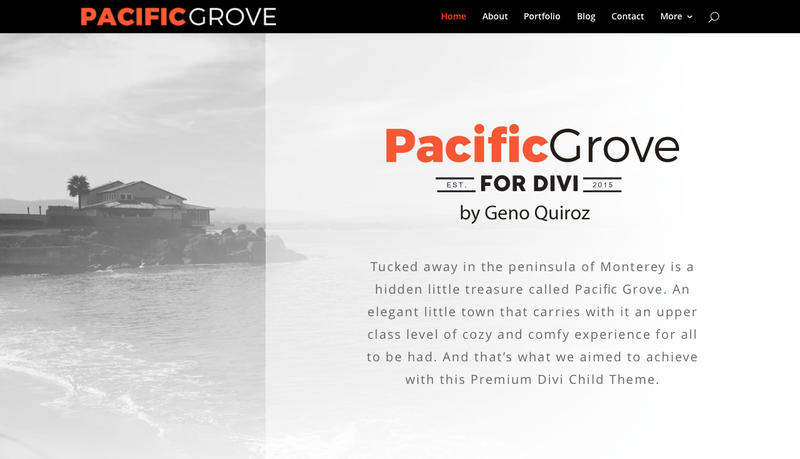 Another Divi 2.4 demo site build, designed by Kenny Sing, Interior has been reverse engineered and embellished into a fully-functional Divi child theme by Aspen Grove Studios. 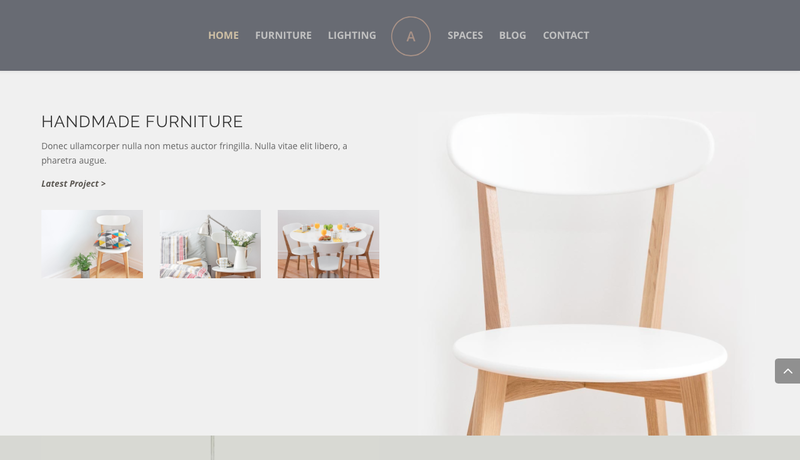 Continuing the themes in Sing’s design, the Interior child theme extends to include an additional 5 pages (3 additional product display pages as well as a blog and contact page). 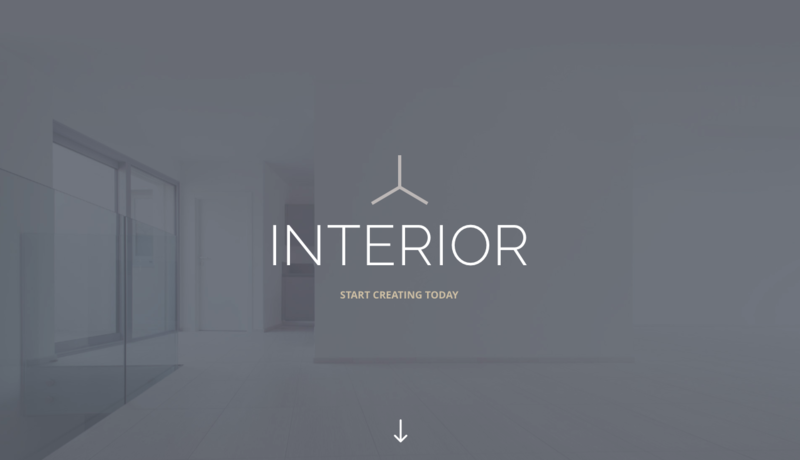 Interior really pushes the boundaries of web design by cleverly using Divi’s native modules and section composition in really creative ways to work effortlessly with the demo imagery. Even if the Interior child theme isn’t the exact best fit for your client’s latest project, it certainly is a great asset for inspiration to bookmark and keep referring to. View the Interior demo or purchase it from Aspen Grove Studios for $ 50.00. 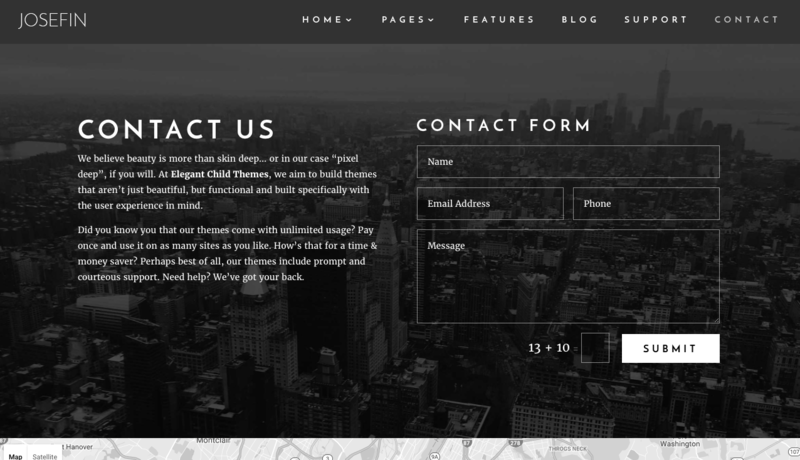 Perfect for communicating a very specific brand objective, landing pages are great vehicles for tactical marketing strategies – such as special promotions, campaigns or valuable brand extensions – that deserve a bit more attention from users than merely an aspect of the main site. 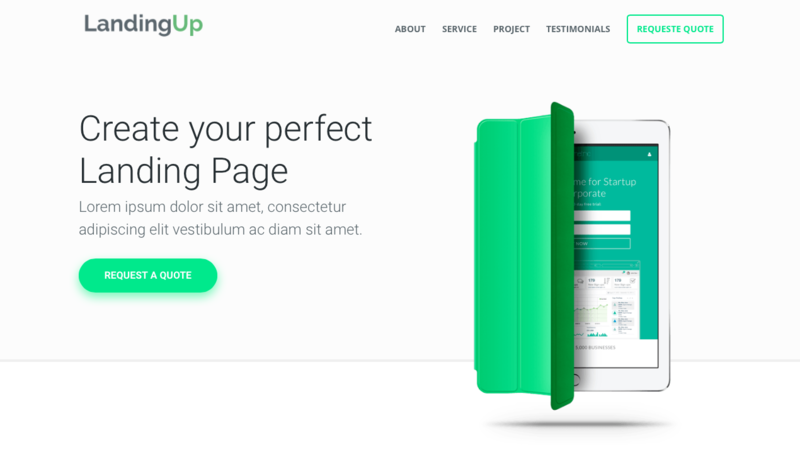 Designed and Developed by Fabio Sarcona of Creative Child Themes, LandingUp lets you create a quick platform to push the sales of a product or service, while LandIf focuses on letting you attract users to join or sign up for a service (possibly a webinar or online course). View the LandingUp demo or purchase it from Creative Child Themes for $ 47.00. View the Landif demo or purchase it from Creative Child Themes for $ 47.00. 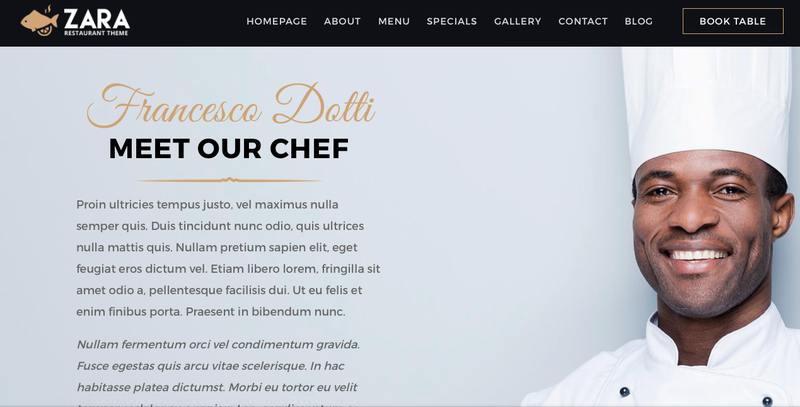 One-page websites have grown from strength to strength and have proven to be more than just a passing trend, as more and more businesses adopt this contemporary form of web communication. 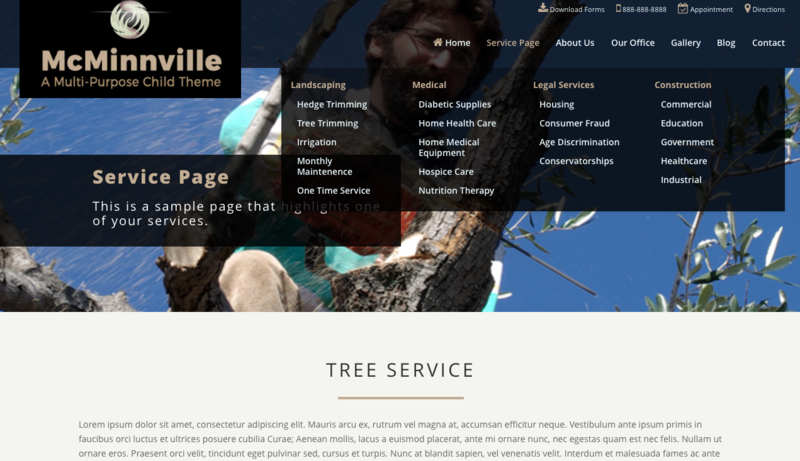 Allowing brands to communicate the crux of their offering without bombarding their users with overtly superfluous information, one-page websites are great vehicles for communicating core brand messages, and too, for grabbing a user’s attention quickly and within the limits of their attention span. 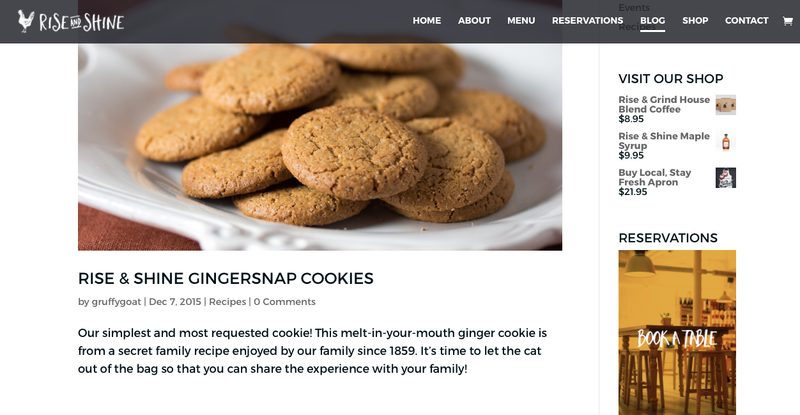 The use of anchor links in menu items steers dynamically to various sections of the single web page, allowing users to find the information they seek in a matter of milliseconds. 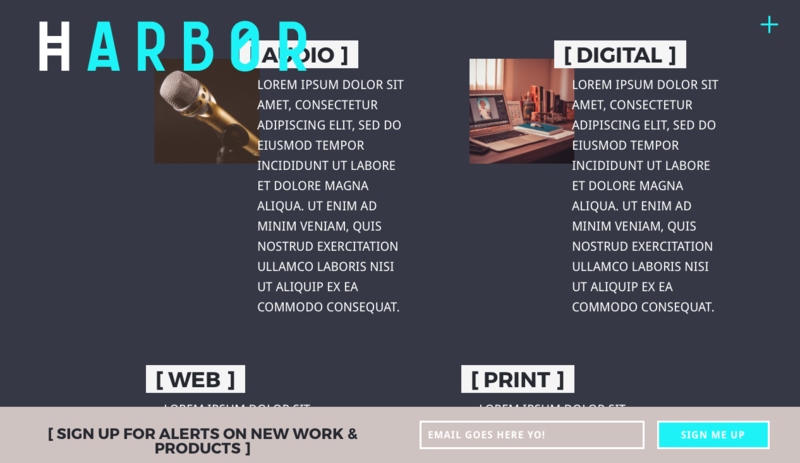 With innovative elements, such as animations and hover effects, teamed with good old fashioned aesthetically pleasing design, one-page websites are great options to suggest to your client should their business and communication requirements fit within the format. 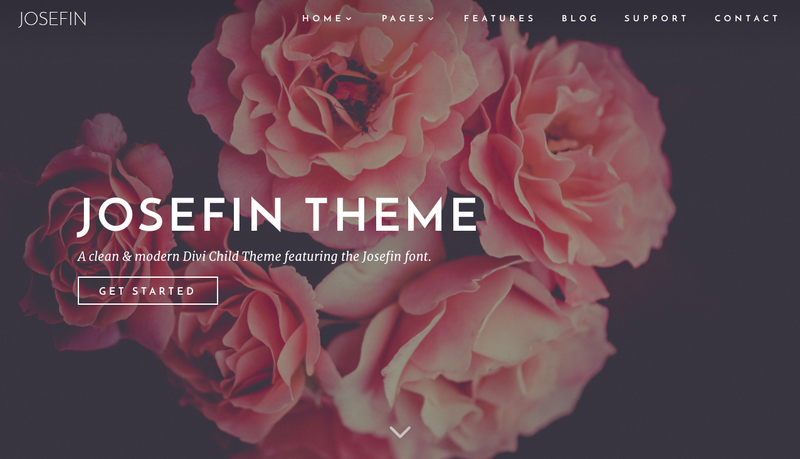 One of the most attractive Divi child themes available is definitely the Josefin theme by Superfly. 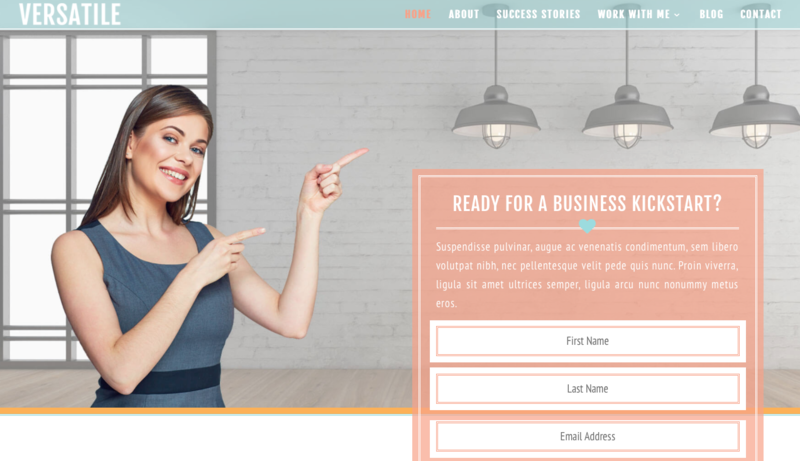 Designed by Artillery Media, Josefin uses the Divi native modules in incredibly creative ways and too, includes some awesome animations across the site. 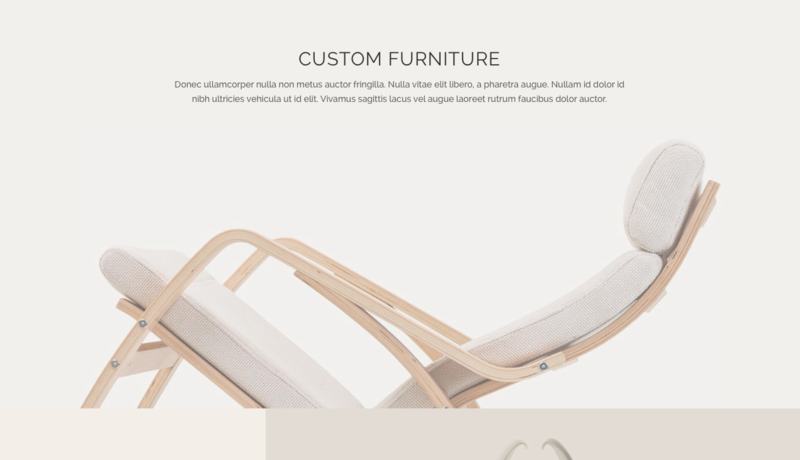 Balancing bold image-ready sections with white space and great typography (of the Josefin font family), Josefin really is a great Divi child theme that you can easily customize to fit a client’s requirements. 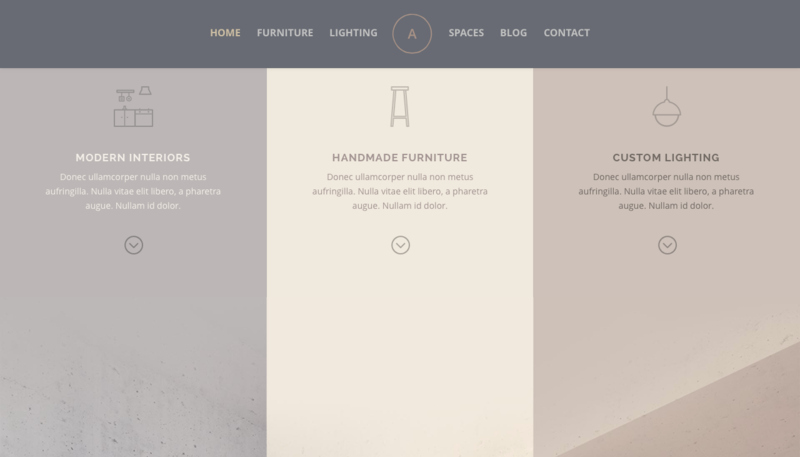 With five alternate home pages to choose from, the customization opportunities are endless. 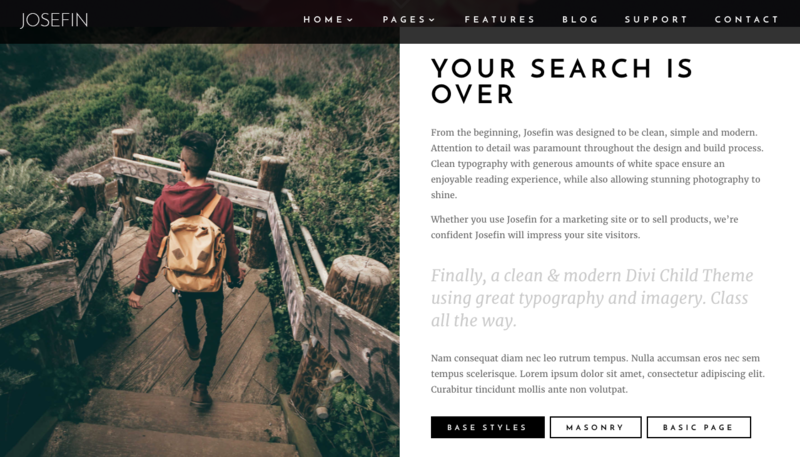 View the Josefin Theme demo or purchase it from Superfly for $ 75.00. 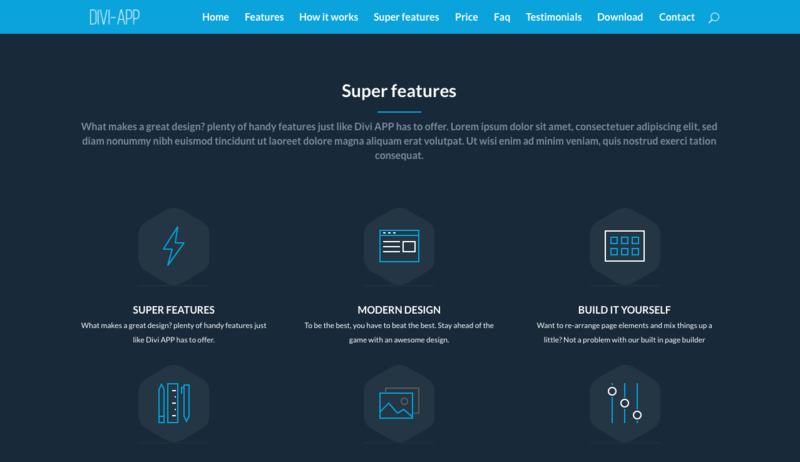 With loads of sections and areas to choose from, Divi App – designed and Developed by Divi Child – is a great one-page website that can be custom tweaked to fit just about any client build. 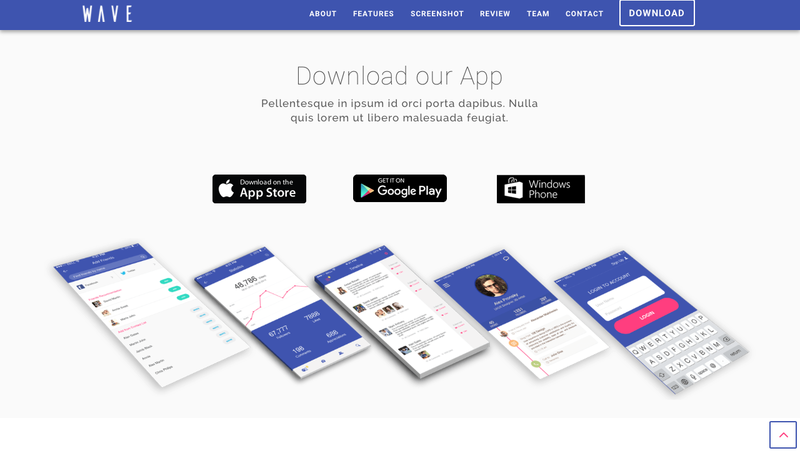 Making use of the latest visual trends in web design, and teaming this with a great color palette and clean font groupings, Divi App is a really great option to consider for a one-page website. 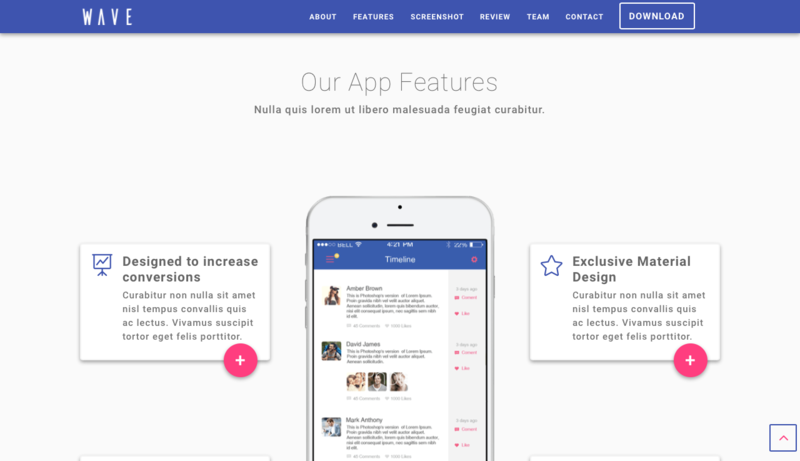 View the Divi App demo or purchase it from Divi Child for $ 85.00. 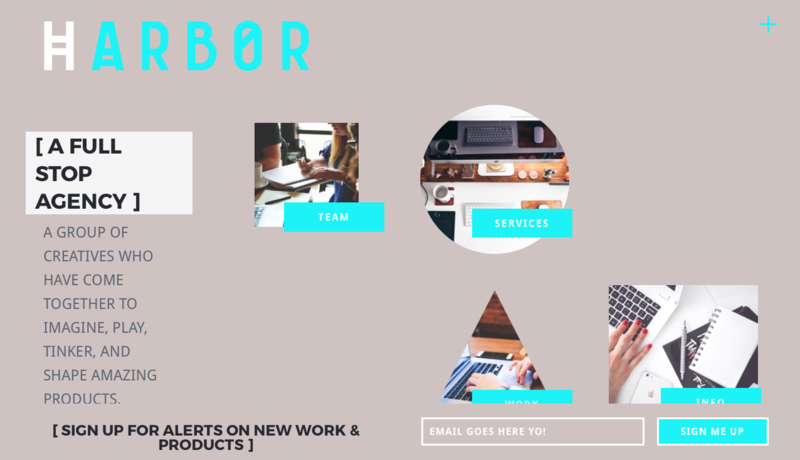 Created by Leslie Bernal of A Girl and Her Mac, Harbor Fresca is a really fresh one-page Divi child theme that has been designed to fit a creative agency. 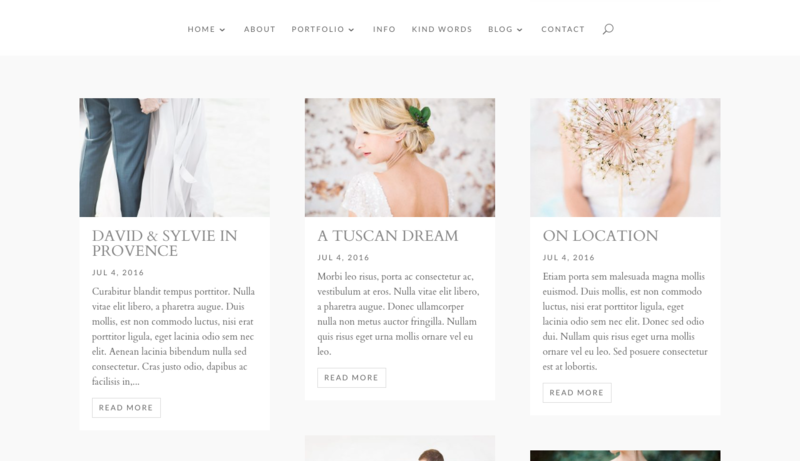 Harbor makes use of a great color palette, bold fonts, and Divi native modules that have been styled in a really interesting way, all culminating in a pretty unique child theme design. 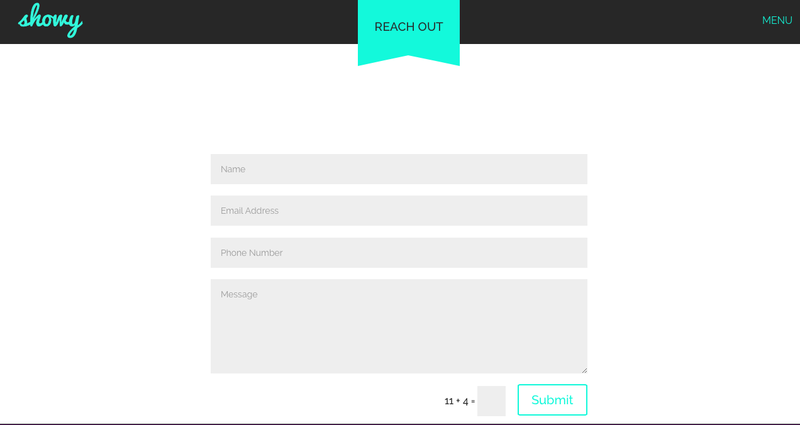 Also, the contact form section is really cool. 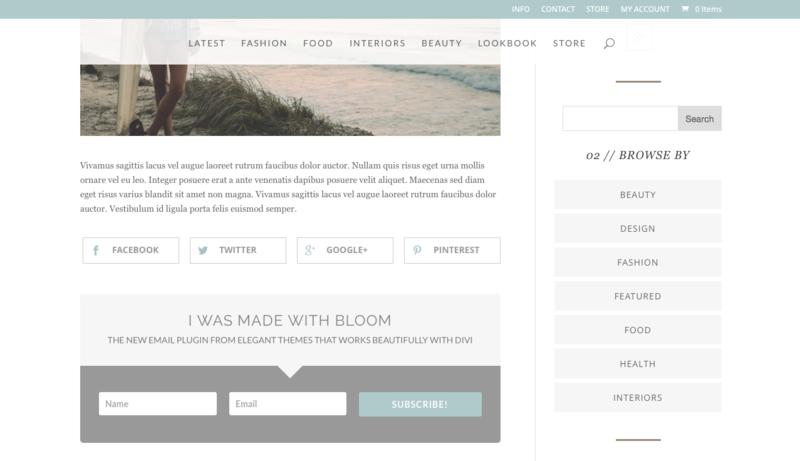 If you like the Harbor Divi child theme, be sure to check out the alternate color scheme called Harbor Seafoam. 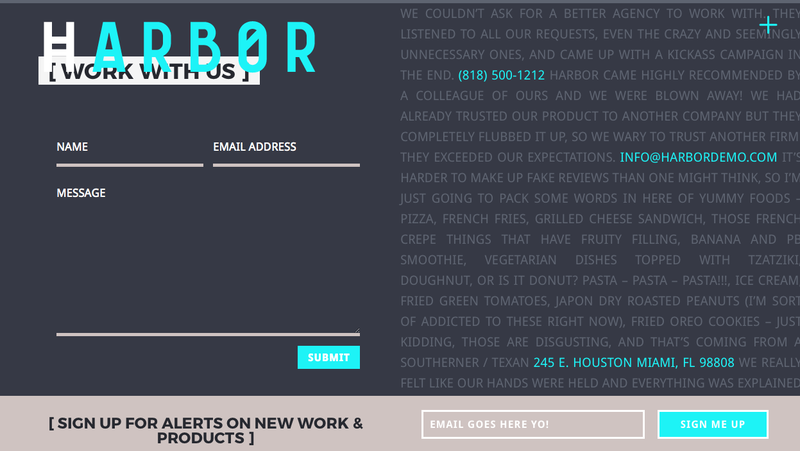 View the Harbor Fresca demo or purchase it from A Girl and Her Mac for $ 85.00. 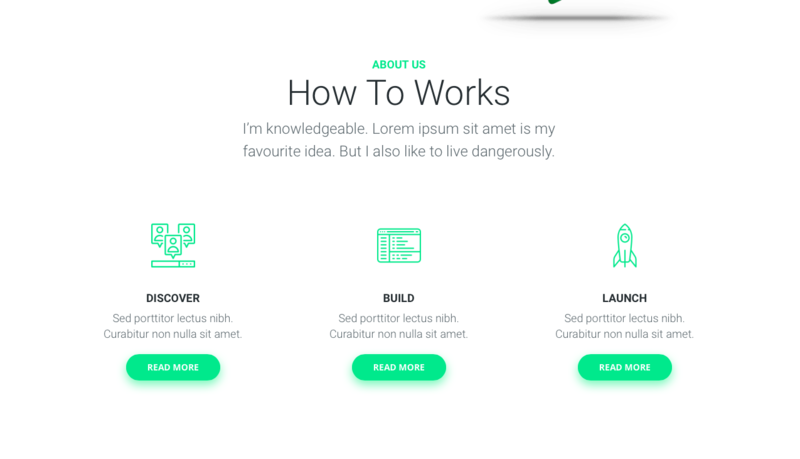 Another release from Divi Child , Anima Pro is a great one-page Divi child theme. 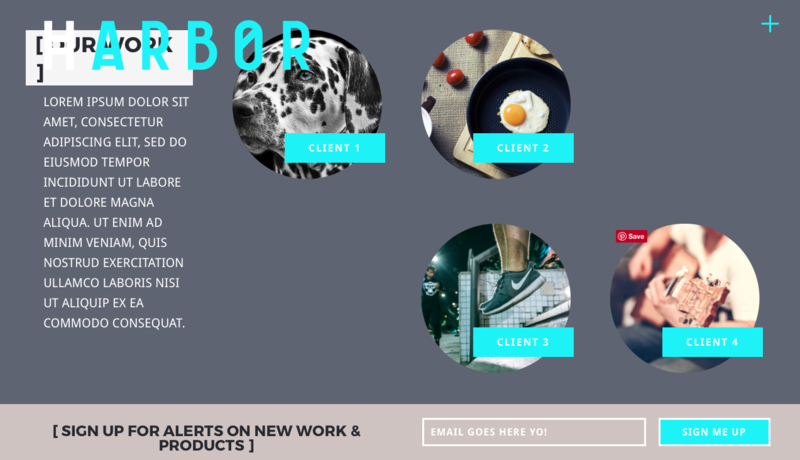 With vibrant colors and great illustrations, Anima Pro has a quirky yet professional look-and-feel that could work well for clients looking for a little bit of an edge for their web presence or to show off their playful side. 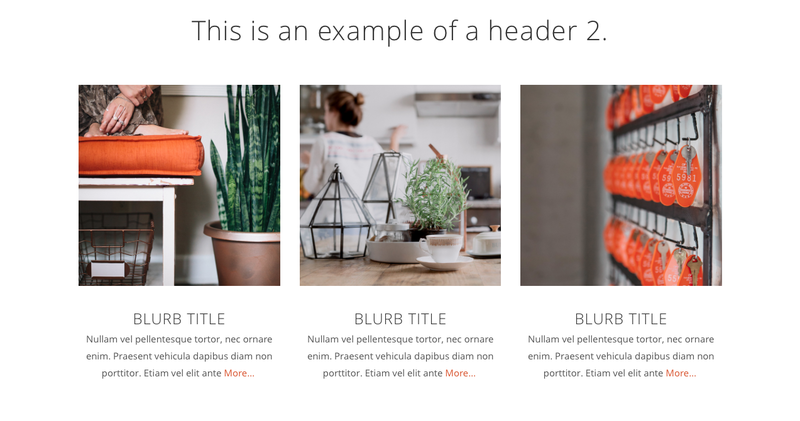 Anima Pro includes a series of module animations – which don’t come standard with the Divi theme or Divi builder plugin – that can really add a touch of extra excitement to a web build. 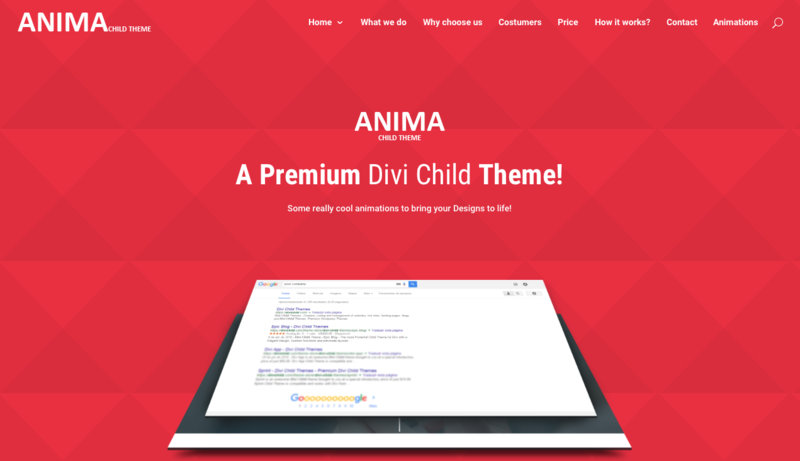 View the Anima Pro demo or purchase it from Divi Child for $ 75.00. 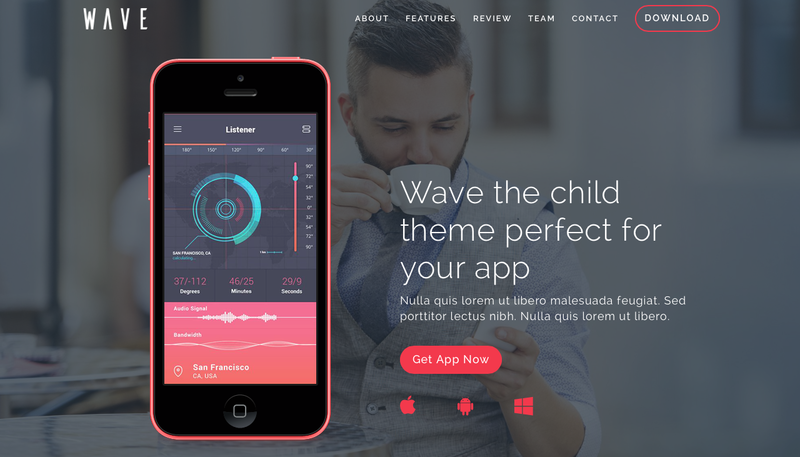 Designed and developed by Fabio Sarcona of Creative Child Themes, Wave Dark is an elegantly designed Divi child theme that is aimed at increasing mobile app and digital product sales. 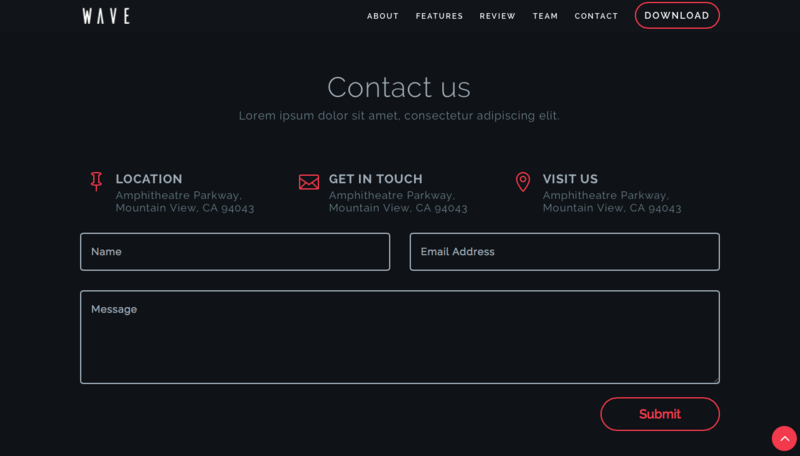 With its clean and modern design, awesome use of type, bold color accents, and prominent call-to-action modules, Wave Dark is sure to really entice your client’s end users. 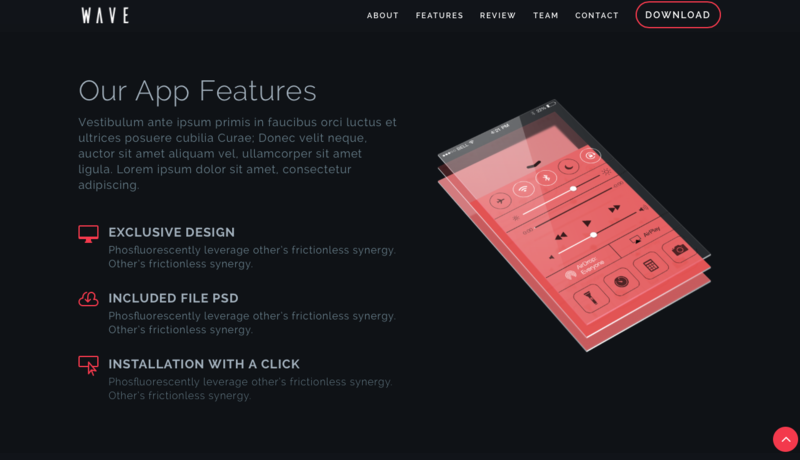 Wave is also available in an alternate color scheme called Wave Material. 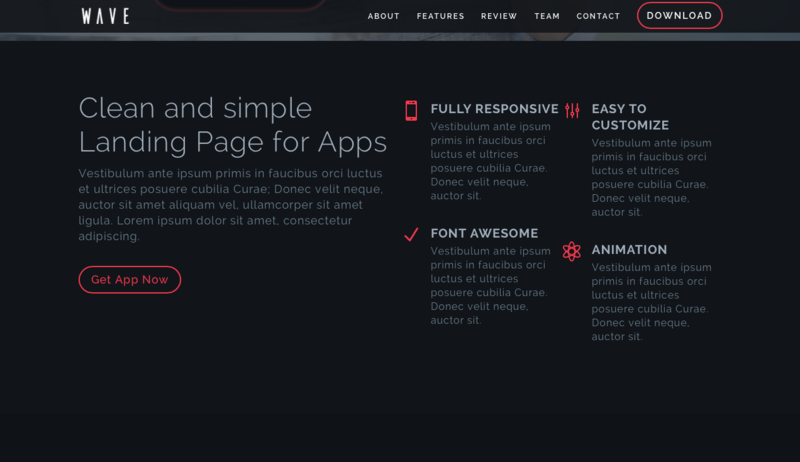 View the Wave Dark demo or purchase it from Creative Child Themes for $ 47.00. Have you used any of the child themes listed above? Which are your favorite and why? 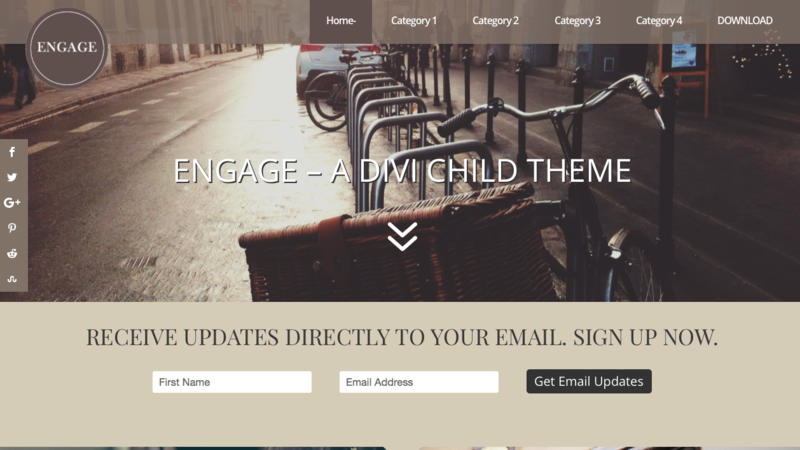 We really hope that you enjoyed reading and that you’re excited to have a look at all of the great Divi child themes in this post. If you have any comments or queries below please feel free to share them below! 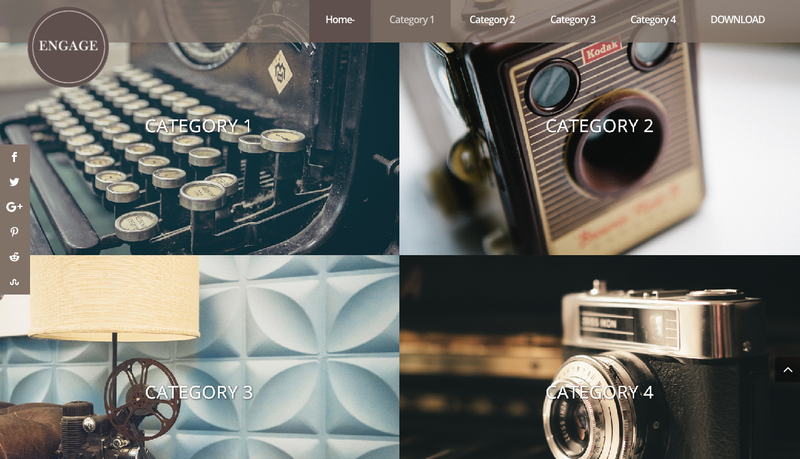 Awesome selection of themes… Thanks Aspen Grove Studios. 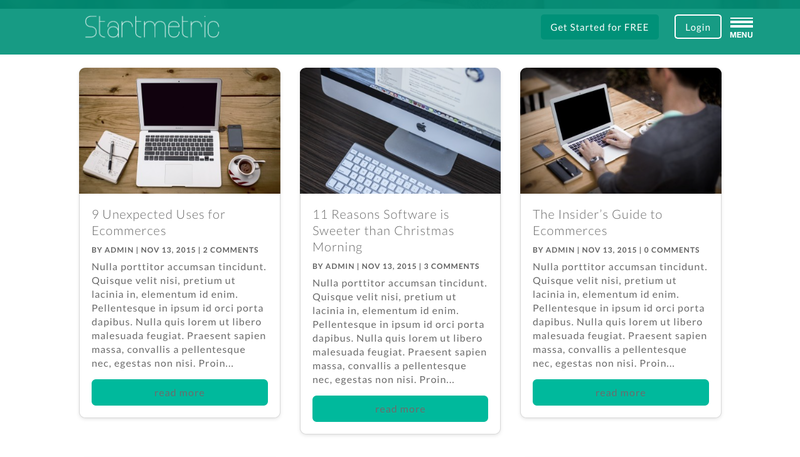 Nice themes! 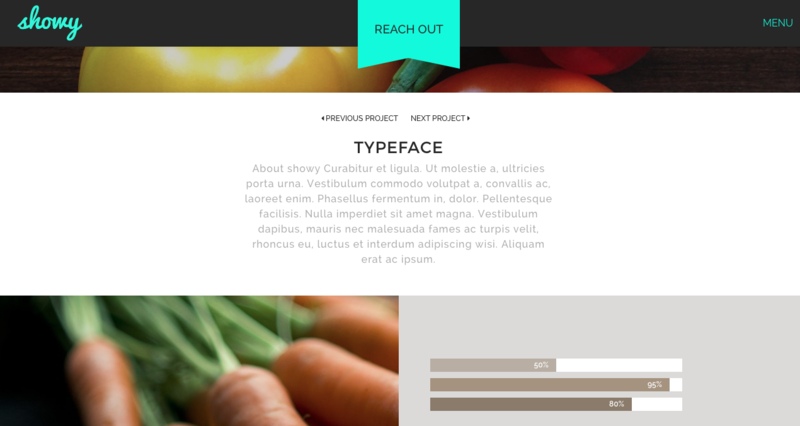 I love seeing what other web designers are developing.